The South has 1,076 native terrestrial vertebrates: 179 amphibians, 525 birds, 176 mammals, and 196 reptiles. Species richness is highest in the Mid-South (856) and Coastal Plain (733), reflecting both the large area of these subregions and the diversity of habitats within them. The geography of species richness varies by taxa. Amphibians flourish in portions of the Piedmont and Appalachian-Cumberland highlands and across the Coastal Plain. Bird richness is highest along the coastal wetlands of the Atlantic Ocean and Gulf of Mexico, mammal richness is highest in the Mid-South and Appalachian-Cumberland highlands, and reptile richness is highest across the southern portion of the region. The South has 142 terrestrial vertebrate species considered to be of conservation concern (e.g., global conservation status rank of critically imperiled, imperiled, or vulnerable), 77 of which are listed as threatened or endangered by the U.S. Fish and Wildlife Service. More than 900 plant species are of concern, 141 of which are threatened or endangered. Threats to biodiversity are occurring throughout the region. The proportion of species at risk varies among taxonomic groups: 46 percent of imperiled vertebrate species are amphibians, followed by reptiles (25 percent), mammals (16 percent), and birds (13 percent). 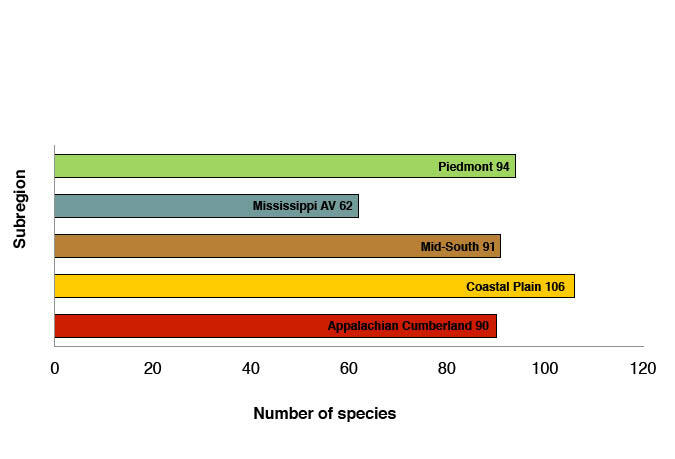 The Coastal Plain (64) and Mid-South (55) lead in the numbers of imperiled vertebrate species, followed by the Appalachian-Cumberland highlands (31), Piedmont (29), and Mississippi Alluvial Valley (9). Hotspots of vertebrate species of conservation concern include the Atlantic and Gulf coasts, Peninsular Florida, and Southern Gulf. Emerging areas of concern include sections within the Appalachian-Cumberland highlands (Blue Ridge, Southern Ridge and Valley, Cumberland Plateau and Mountain, Interior Low Plateau) and Mid-South (Ozark-Ouachita Highlands, West Texas Basin and Range, and Cross Timbers). Hotspot areas for plants of concern are Big Bend National Park; the Apalachicola area of the Southern Gulf Coast; Lake Wales Ridge and the area south of Lake Okeechobee in Peninsular Florida; and coastal counties of North Carolina in the Atlantic Coastal Plain. The Appalachian-Cumberland highlands also contain plants identified by States as species of concern. Species, including those of conservation concern, are imperiled by habitat alteration, isolation, introduction of invasive species, environmental pollutants, commercial development, human disturbance, and exploitation. Conditions predicted by the forecasts will magnify these stressors. Each species varies in its vulnerability to forecasted threats, and these threats vary by subregion. Key areas of concern arise where hotspots of vulnerable species coincide with forecasted stressors. There are 614 species that are presumed extirpated from selected States in the South; 64 are terrestrial vertebrates and 550 are vascular plants. Over 50 percent of the terrestrial vertebrates are new to this list since the Southern Forest Resource Assessment. Factors contributing to their demise include urban growth, industrial development, incompatible agricultural practices, degradation of wetlands, alteration of natural hydrological conditions, pesticide contamination, natural and human-caused disturbance, and destruction of locally unique habitats. Mid-South: Forest loss and urban growth in the Ozark-Ouachita Highlands threatens concentrations of plant and animal species. Urban development along southern borders of Texas and Louisiana in the Cross Timbers and Western Gulf sections could impact a large number of reptiles and birds. Appalachian-Cumberland highlands: Forecasted changes in the Interior Low Plateau of central Kentucky and Tennessee threaten bats and plants associated with limestone glades. Urban development in the Southern Appalachians could imperil the diversity of salamanders. Recreational use may add additional pressure on rare communities, and climate change threatens species endemic to high elevation areas. Piedmont: Substantial urban growth and forest loss could degrade the diversity of amphibians, mammals, and plants, although species in inaccessible sites (such as rock outcrops) may be less at risk. Management on public land may become difficult due to the population pressure in surrounding counties. Species in areas transitional to other subregions may also be threatened by climate change. Mississippi Alluvial Valley: Urban growth forecasts for the Deltaic Plain could degrade the richness of shorebirds and waterfowl in the wetlands of the Mississippi Flyway as well as habitat for the Louisiana black bear. Sea level rise could inundate the coastal habitat inhabited by numerous species. Coastal Plain: Urban development could threaten species along both coasts and within the Florida Peninsula, which serves as stopover habitat in the Atlantic Flyway and nesting habitat for imperiled sea turtles. The flora of inland ecosystems is threatened by changing fire regimes. Projected inundation of mangrove and coastal live oak forests from sea level rise would reduce habitat for several taxa. High elevation forests: Spruce-fir forests in the Southern Appalachians are subject to air pollution, acid deposition, and natural disturbances. Climate warming and further housing development may result in the loss of endemic species or changes in species ranges. Upland hardwood forests: Declines are predicted at 14 percent throughout the region under the Cornerstone that forecasts higher levels of urbanization and lower timber prices. Predicted northward shifts in species distributions could threaten forest interior species and reassemble forest types, including the widely distributed oak-hickory forest. Longleaf pine forests: Portions of the Coastal Plain are expected to lose acreage under the Cornerstone that forecasts higher urbanization and higher timber prices, while south-central Florida and northwest Alabama are predicted to gain acreage of this forest type. Early successional forests: Under the Cornerstone that forecasts higher urbanization and higher timber prices, the greatest losses are expected in the Northern Ridge and Valley section, southern Florida and associated Keys, and scattered locations in coastal Virginia and North Carolina. Gains are expected in the Ridge and Valley of east Tennessee, Cumberland Plateau and Mountains, Apalachicola region of Florida, Ozark-Ouachita Highlands, and adjacent northern area of the Mississippi Alluvial Valley. Climate change is an additional source of stress on terrestrial species and ecosystems. Projections of temperature increase and variability in precipitation patterns may change the future distribution of many species, influencing seasonal movement, recruitment, and mortality. Species may move into the habitats of others, creating new assemblages; changes in phenology will affect the timing of resource availability. Species at risk from climate change include those with restricted geographic ranges, patchy distributions, and those that occur at the margins of their ranges. Other characteristics include limited dispersal ability, low genetic diversity, affinity to aquatic habitats, narrow physiological tolerance, and late maturation. Communities at high elevations, grassland communities, and wetland ecosystems may be particularly susceptible to climate change. Species whose ranges are limited to coastal areas will be vulnerable to projected changes in sea level. Sea level rise may inundate barrier islands, coastal wetlands, and marshes of the Coastal Plain, as well as along the eastern Atlantic and Gulf coasts. The forecasts pose challenges on how best to implement future conservation and management strategies. New tools and approaches to managing uncertainty (e.g., scenario planning, sensitivity analysis, or ecological risk analysis) may become routine. Integrating climate science into management planning will be important, accompanied by monitoring strategies that identify patterns in disturbance, phenology, and range changes. As future impacts occur across large areas, the appropriate decision-making level may shift to cover landscape or regional scales; temporal scales will be longer than typically considered. An awareness of the relationship between the forecasts and the geographic pattern of species occurrence will foster planning efforts. The implications for the conservation of southern species are significant: in the midst of a growing region, the provision of biological diversity will become a critical conservation issue. The diversity of plant and animal communities in the South ranges from high elevation forests to coastal wetlands, barrier islands, and arid regions of west Texas. Factors contributing to the diversity of these communities include regional gradients in climate, geologic and edaphic site conditions, topographic variation, and natural disturbance processes (Boyce and Martin 1993, Delcourt and others 1993, Healy 1985). These factors have contributed to the diversity of several species groups: salamanders, snakes, and turtles (White and others 1998). Throughout the South, the evolution of plants and animals combines with the isolation that characterizes some habitats to produce many pockets of endemism. Endemic species are unique to a given geographic area or locale (http://en.wikipedia.org/wiki/Cosmopolitan_distribution); physical, climatic, and biological factors can contribute to endemism. Centuries of land use change have modified the southern landscape, resulting in the disappearance and endangerment of species communities. Habitat loss and degradation have become serious threats (Buckner 1989, Noss and others 1995, Williams 1989). Rapid population growth has resulted in land-use conversion (such as wetland drainage and channelization), urban sprawl, and habitat fragmentation (White and others 1998). Landscape modification has led to habitat isolation, water and air pollution, and altered disturbance regimes (Lorimer 2001, Trani and others 2001). The introduction of nonnative invasive species (Wilcove and others 1998) is a major concern, as is the proliferation of the illegal pet trade (Bailey and others 2006). The fragmentation of forests that occurs with the conversion of forest habitats often eliminates or displaces species from a site simply because less habitat occurring in smaller and more isolated patches supports fewer species (MacArthur and Wilson 1967). This effect has been shown in fragments of globally imperiled pine rockland forest scattered within urban South Florida (Possley and others 2008), where the result has been fewer plant species and high variance in species richness. Reduced population size can decrease genetic diversity and outcrossing rates (Aguilar and others 2008, Godt and others 1996), while microclimate gradients from edge to interior habitats alter species composition (Honu and others 2009, Matlack 1994). Forest edge provides habitat for invasive species, and decreases habitat for interior species (Fridley and others 2009, Guirado and others 2006). Another concern is the effect of changing climate on plant and animal communities. Species that are rare because of restrictive or specialized needs are especially at risk. Climate change is one of the factors attributed to amphibian declines (Trani 2002b) and is a special concern for high elevation communities. Along with suffering the direct effects of sea level rise—changes in temperature, precipitation, and coastal inundation—species are indirectly affected by changes in fire regimes and species interactions. Each topic is addressed for the region as a whole and by subregion and section. The focus is on terrestrial vertebrate species, vascular plants, and select forest communities identified during public meetings held throughout the region (Wear and others 2009). Additional information on forest communities is provided in chapter 4 (land uses), chapter 5 (forest conditions), chapter 3 (climate change), chapter 16 (invasive insects and diseases), and chapter 15 (invasive plant species). Terrestrial species of non-forest habitats, such as arid west Texas, are included. However, because aquatic species were examined in extensive detail in Herrig and Shute (2002) and were not identified as a concern during the public meetings, they are not covered here. The major species groups included in this analysis consist of the following: birds, mammals, reptiles, amphibians, and vascular plants. The analysis includes forest or non-forest dwelling species that are native to the South. For analyses using range maps, the following were excluded: historic, introduced, and extirpated/extinct portions of a species range. Critically imperiled—At a very high risk of extirpation due to extreme rarity (often five or fewer occurrences), very steep declines, or other factors. Critically imperiled globally because of extreme rarity or because of some factor(s) the organism especially vulnerable to extinction. Typically 5 or fewer occurrences or very few remaining individuals (<1,000) or acres (<2,000) or linear miles (<10). Imperiled—At high risk of extirpation due to very restricted range, very few populations (often 20 or fewer), steep declines, or other factors. Imperiled globally because of rarity or because of some factor(s) the organism very vulnerable to extinction or elimination. Typically 6 to 20 occurrences or few remaining individuals (1,000 to 3,000) or acres (2,000 to 10,000) or linear miles (10 to 50). Vulnerable—At moderate risk of extirpation due to a restricted range, relatively few populations (often 80 or fewer), recent and widespread declines, or other factors. Vulnerable globally either because the organism is very rare and local throughout its range, found only in a restricted range (even if abundant at some locations), or because of other factors making it vulnerable to extinction or elimination. Typically 21 to 100 occurrences or between 3,000 and 10,000 individuals. Apparently secure—Uncommon but not rare; some cause for long-term concern due to declines or other factors—although the organism may be rare in parts of its range, particularly on the periphery—and usually widespread. Apparently not vulnerable in most of its range, but possibly cause for long-term concern. Typically more than 100 occurrences and more than 10,000 individuals. Secure—Common, widespread, and abundant—although the organism may be rare in parts of its range, particularly on the periphery. Not vulnerable in most of its range. Typically with considerably more than 100 occurrences and more than 10,000 individuals. Possibly Extirpated—Known from only historical records; evidence that the species may no longer be present, but not enough to state this with certainty. A species has been searched for unsuccessfully, but not thoroughly enough to presume that it is no longer present. Presumed Extirpated—Species is believed to be extirpated from the state. Not located despite intensive searches of historical sites and other appropriate habitat, and virtually no likelihood that it will be rediscovered. Geographic shapefiles for each section, subregion, and region boundary used for the Futures analyses (fig. 14.1) were obtained from the Forest Service, U.S. Department of Agriculture. (Further description of these areas, and the process of their delineation, can be found in chapter 1). Shapefiles of the occurrence and range records were extracted from NatureServe’s central databases for species matching project criteria. The species shapefiles were separately intersected against the county, section, and subregion GIS layers using a series of spatial join processes to attribute each individual occurrence record and range polygon to appropriate county, section, and subregion polygons (McNees 2010). The county boundaries layer was downloaded from the U.S. Geological Survey. The attribute table from the output layer of each spatial join process in the step above was imported into Microsoft Access. The results tables were combined so that there was a single table for the county, section, and subregion results; these were then summarized to create unique lists of species within each area. Crosstab queries generated counts by taxonomic groupings and conservation rank categories. A series of map image files were produced in .gif format (200 dpi resolution) using ArcMap showing the various counts of species by county for the South. Areas of unique species richness or rarity were identified and representative species occurring in these areas described. Legend categories were determined using the natural breaks method for dividing a range of numeric values into categories, an iterative process to minimize within-category variance. 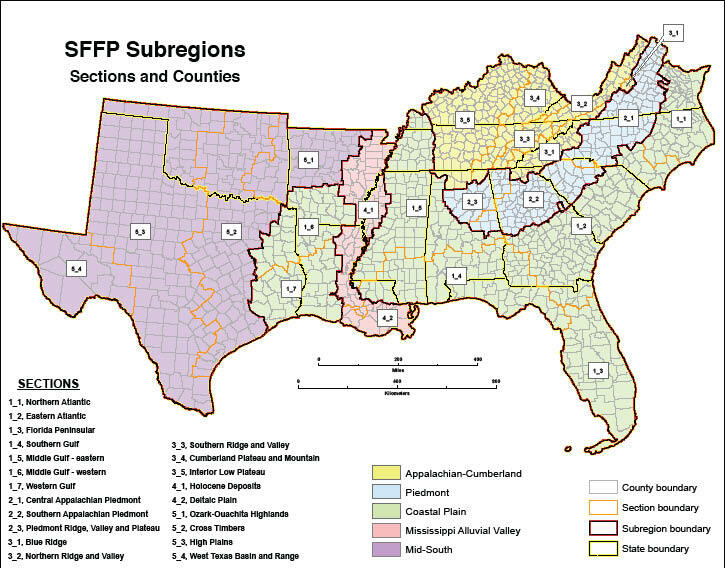 Figure 14.1—The subregion and section boundaries of the Southern Forest Futures analysis. Cornerstone scenarios were selected for the analysis of biodiversity-forecast stressors based on their potential for future impacts in the South. The spatial products created during the initial geographic analysis (patterns of species richness and rarity) were then analyzed in contrast with the forecast maps generated for urban growth (chapter 4), forest loss (chapter 5), and climate change (chapter 3). Patterns of coincidence were identified and examined; selected areas of particular concern were described where forecasted stressors coincided with species richness and rarity by subregion and section. A synthesis of the published literature further described how anticipated land use change, human population growth, urbanization, and related infrastructure development could affect species in the South. GIS maps of special forest communities under selected forecasts were developed from Forest Inventory and Analysis data (chapter 5). Distributions for 2010 and 2060 and percentage changes were described for longleaf pine, early successional forest, and upland hardwood forest along with a discussion of potential impacts on the species that inhabit these communities. The foundation of this analysis consists of global (range-wide) tracking data developed by NatureServe (2010, 2011) and State-level tracking data provided by Natural Heritage Programs across the South. Use of standard ranking criteria and definitions makes Natural Heritage ranks comparable across taxa groups and across jurisdictions. Standardized criteria include population size, area of occupancy, population trends, suspected threats, environmental specificity, and viability of extant populations. Species data are updated annually, incorporating new information provided by field surveys, monitoring activities, and literature reviews. 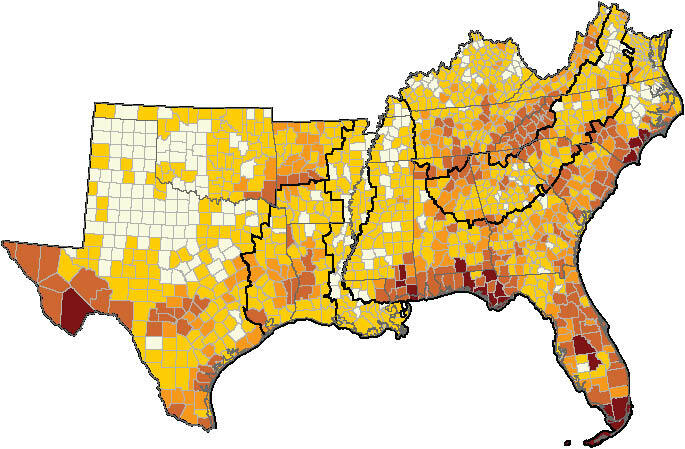 Systematic surveys for imperiled and other species occurrence vary across counties in the South. These data gaps and other limitations are discussed in the Knowledge and Information Gaps section. The species locations were derived from element of occurrence and range map data sources. For species considered at-risk (G1-G3) or those having Federal listing status, the data were based on NatureServe’s element of occurrence database which is based on observed locations of species (for G3 species that lack occurrence records, range map data were substituted). The threatened or endangered species listed by the U.S. Fish and Wildlife Service were verified from the U.S. Department of the Interior (2011). Digital Distribution Maps of the Birds of the Western Hemisphere (Ridgely and others 2007). ArcView shapefiles contain the known range of each species depicted as polygons where a species is widespread, or as points where there are isolated records. Not all vagrant occurrences are depicted. Data were provided by NatureServe in collaboration with Robert Ridgely, James Zook, The Nature Conservancy Migratory Bird Program, Conservation International Center for Applied Biodiversity Science (CABS), World Wildlife Fund US, and Environment Canada WILDSPACE. Digital Distribution Maps of the Mammals of the Western Hemisphere (Patterson and others 2007). ArcView shape files contain the known range of each species depicted as polygons where a species is widespread, or as points where there are isolated records. Data were provided by NatureServe in collaboration with The Nature Conservancy, Conservation International CABS, World Wildlife Fund US, and Environment Canada WILDSPACE. Digital Distribution Maps of the Reptiles of the United States and Canada (NatureServe 2007). This dataset contains distribution information for terrestrial and aquatic reptiles, crocodilians, and turtles occurring in the United States and Canada. Distribution maps accompany Red List Assessments and species accounts in NatureServe Explorer (www.natureserve.org/Explorer/). Annotated maps indicate scale, sources, taxonomic decisions, current range, origin, and island distributions where applicable. Digital Distribution Maps of the International Union for Conservation of Nature Red List of Threatened Species: Amphibian Range Maps (International Union for Conservation of Nature 2009). Part of a global biodiversity assessment, the dataset contains spatial data for approximately 20,000 species including amphibians. The data are held in shapefiles; the known range of each species is depicted in polygon format. The terrestrial vertebrates of the South consist of 1,076 native species (NatureServe 2011): 179 amphibians, 525 birds, 176 mammals, and 196 reptiles. Species richness is highest in the Mid-South (856) and Coastal Plain (733). It is evident that species richness is influenced by a species-area relationship among the subregions. Richness reflects the large area of these subregions (chapter 1) and the diversity of habitats within them. The remaining, smaller subregions support fewer vertebrate species: 528 for the Piedmont, 501 for the Mississippi Alluvial Valley, and 484 for the Appalachian-Cumberland highlands. To support this relationship further, NatureServe Explorer (2010) lists 153 ecosystems in the Coastal Plain and 115 ecosystems in the Mid-South. In comparison, the other subregions support 77 (Appalachian-Cumberland highlands), 22 (Piedmont), and 22 (Mississippi Alluvial Valley) ecosystems, respectively. Here, ecosystem is used in its traditional sense and represents recurring groups of communities found in comparable environments that are influenced by similar ecological processes such as fire or flooding (NatureServe 2011). The variation in species richness is influenced by differences in geographic location and environmental complexity (fig. 14.2). The most diverse locations follow the coastal areas, starting at the Southern Gulf and moving westward across the Mid-South to the West Texas Basin and Range. These areas support numerous tropical species that reach their northern limits at this latitude (Stein and others 2000). The Ozark-Ouachita Highlands and Cross Timbers areas north of this band also support habitat for an impressive number of amphibian and reptile species, respectively. Areas of richness also occur along the Atlantic Coast from northern Florida to Virginia. Although figure 14.2 highlights the geographic patterns that cross the four taxonomic groupings, there are differences that are not evident from the composite map. These are reported by subregion and section in table 14.2. Table 14.2—Vertebrate species richness by ecological subregion and section (NatureServe 2011). Amphibians—This taxon reaches its uppermost species richness in the South (Bailey and others 2006). Of the 179 amphibian species that occur in the region, the majority are salamanders (113): mole salamanders, hellbenders, lungless salamanders, mudpuppies, and sirens. Frogs and toads (66 species) constitute the second group. Characteristic species include true frogs, tree frogs, chorus frogs, cricket frogs, true toads, narrowmouth toads, and spadefoot toads. Amphibians are an increasing important consideration in many issues of conservation concern. Amphibians use ephemeral pools, seeps, bogs, caves, forests, floodplain and isolated wetlands, small ponds, and other habitats. The longleaf pine/wiregrass community, cypress-gum swamps, and mixed hardwood-pine habitats support a variety of species. Coastal bayous and slow-moving rivers provide habitat for sirens and amphiumas, while hellbenders prefer cool, fast-flowing upland rivers. Some amphibians have geographic ranges that are restricted to specific physiographic regions. For example, Coastal Plain forests are important for mole salamanders, while other amphibians occur in small, isolated populations in high elevation areas that retain northern climates (Gibbons and Buhlmann 2001). Moisture is a limiting factor: several terrestrial species migrate to aquatic habitats for egg deposition, while aquatic species use terrestrial habitat for dispersal of juveniles and other seasonal activity. Leaf litter, fallen logs, moist soils, and other surface debris serve as refugia from drying conditions. The Coastal Plain (106 species) leads in amphibian richness, followed closely by the Piedmont (94), Mid-South (91), and Appalachian-Cumberland highlands (90). Sixty-two species of amphibians inhabit the Mississippi Alluvial Valley (fig. 14.3). Salamander richness is highest in the Appalachian-Cumberland highlands (64) and Piedmont (61), and frog and toad richness is greatest in the Coastal Plain (50) and Mid-South (46). The distribution of amphibians across the South is far reaching, encompassing mountains, highlands, and coastal areas along the Atlantic Ocean and Gulf of Mexico (fig. 14.4). The Southern Appalachians support notable richness levels of salamander species in the Blue Ridge (54), Central Appalachian Piedmont (48), Southern Appalachian Piedmont (43), and both Ridge and Valley sections (41). Characteristic species include the cave salamander (Eurycea lucifuga), dusky salamander (Desmognathus fuscus), eastern newt (Notophthalmus viridescens), lesser siren (Siren intermedia), marbled salamander (Ambystoma opacum), and mudpuppy (Necturus maculosus). Frog and toad richness is highest in the Cross Timbers (38) and High Plains (37) sections of the Mid-South and Southern Gulf (34) section of the Coastal Plain (table 14.2). The two Mid-South areas provide habitat for the Cajun chorus frog (Pseudacris fouquettei), Cope’s gray treefrog (Hyla chrysoscelis), southern leopard frog (Rana sphenocephala), eastern narrow-mouthed toad (Gastrophryne carolinensis), Hurter’s spadefoot (Scaphiopus hurterii), and red-spotted toad (Bufo punctatus). The Southern Gulf supports the barking treefrog (Hyla gratiosa), Coastal Plain toad (Bufo nebulifer), and spring peeper (Pseudacris crucifer). The areas that support a diversity of both amphibian assemblages form an arc across the southern portion of the Northern Atlantic (51 species), Eastern Atlantic (60 species), westward across the Southern Gulf (67 species), and northwest across the Middle Gulf-Eastern (67 species), the Holocene Deposits section of the Mississippi River (59 species), and the Ozark-Ouachita Highlands (58 species). The two Atlantic sections provide habitat for the four-toed salamander (Hemidactylium scutatum), northern dwarf siren (Pseudobranchus striatus), and spotted salamander (Ambystoma maculatum). The Southern and Middle Gulf-Eastern locations provide habitat for the three-lined salamander (Eurycea guttolineata) and Woodhouse’s toad (Bufo woodhousii). Numerous frogs, toads, and salamanders inhabit the Holocene Deposits including the Gulf Coast waterdog (Necturus beyeri complex), Louisiana slimy salamander (Plethodon kisatchie), and Ozark zigzag salamander (Plethodon angusticlavius). Characteristic species occurring in the Ozark-Ouachita Highlands include the pickerel frog (Rana palustris), Plains leopard frog (Rana blairi), Ozark hellbender (Cryptobranchus alleganiensis bishopi), and three-toed amphiuma (Amphiuma tridactylum). Figure 14.3—Richness of amphibian species by subregion in the South. Birds—The moderate climate and diverse forests across the South sustain abundant and diverse communities of breeding, wintering, and migrating birds. The region supports 525 avian species (NatureServe 2011), which include perching birds, shorebirds, wading birds, waterfowl, and raptors. Perching birds comprise the majority of bird species (256 species). Included in this subgroup are flycatchers, crows, swallows, jays, wrens, vireos, grackles, orioles, finches, sparrows, and warblers. The NatureServe category of “Other Birds” includes 137 species represented by several gamebirds, woodpeckers, and open ocean birds such as cormorants, petrels, and pelicans. There are 41 species classified as waterfowl; representative birds include mottled ducks, Canada geese, wood ducks, and mallards. Shorebird examples (41 species) include plovers and curlews, and wading bird examples (20 species) include sandhill cranes and flamingos. The 30 raptors occurring in the South include eagles, hawks, kites, and vultures. The distribution of birds is influenced by a combination of local and landscape conditions. Local features include habitat composition, structural diversity, and successional stage. Landscape conditions include habitat patch size, interspersion of vegetative communities, edge length, interpatch distance, interior forest, adjacent land use, and spatial heterogeneity. The South provides habitat for summer breeding populations, overwintering birds, and birds that migrate to South America. Coastal and maritime forest communities provide important habitat for these species. The peak number of bird species (469) occurs in the Mid-South (fig. 14.5), where perching bird (241) and raptor (28) diversity occur in highest numbers. The Mid-South’s impressive diversity is due to its extent, habitat heterogeneity, and central placement along the Nation’s southern border. Second to the Mid-South is the Coastal Plain (395), which supports the majority of waterfowl (38), shorebirds (40), and wading birds (21). The next tier is led by the Mississippi Alluvial Valley (306), Piedmont (283), and Appalachian-Cumberland highlands (257). Bird richness along the coastal areas and wetlands of the Atlantic Ocean and Gulf of Mexico points to the importance of this habitat (fig. 14.6). The pattern across the southernmost portions of Texas and Peninsular Florida reflects those species typical of Latin America and the Caribbean (Stein and others 2000). Of particular prominence are the Southern Gulf; the portions of the Cross Timbers and High Plains that form the Texas eastern coastline; and the Western Gulf and Deltaic Plain at the mouth of the Mississippi River. The two Mid-South sections each support habitat for over 360 species; these include Cooper’s hawk (Accipiter cooperii), golden eagle (Aquila chrysaetos), white-tailed kite (Elanus leucurus), Le Conte’s sparrow (Ammodramus leconteii), juniper titmouse (Baeolophus ridgwayi), and canyon wren (Catherpes mexicanus). The Northern Atlantic and Western Gulf provide habitat for a diversity of waterfowl including American wigeon (Anas americana), blue-winged teal (Anas discors), bufflehead (Bucephala albeola), hooded merganser (Lophodytes cucullatus), and lesser scaup (Aythya affinis). The salt marshes of the Northern Atlantic also support important breeding and wintering populations of the American black duck (Anas rubripes) and black rail (Laterallus jamaicensis). Numerous wading birds inhabit the Southern Gulf and Florida Peninsula including the great egret (Ardea alba), little blue heron (Egretta caerulea), and white-faced ibis (Plegadis chihi). Thirty-three species of shorebirds occur in the Eastern Atlantic, Northern Atlantic, and Western Gulf; characteristic species include the American oystercatcher (Haematopus palliatus), dunlin (Calidris alpina), greater yellowlegs (Tringa melanoleuca), and upland sandpiper (Bartramia longicauda). Figure 14.5—Richness of bird species by subregion in the South. Mammals—Terrestrial, marine, and freshwater habitats in the South are home to 176 native mammals (NatureServe 2011) including rodents, bats, and carnivores. Rodents (79 species) are the largest group, with representative species including squirrels, pocket gophers, voles, jumping and harvest mice, and muskrats. There are 39 species of bats inhabiting the region. Foxes, weasels, canids, and skunks are among the 25 species of carnivores. The relative absence of large, native carnivores reflects the history of European settlement (Trani and others 2007). The American black bear (Ursus americanus) is the largest carnivore currently inhabiting the South. The NatureServe category of “other mammals” includes 33 species represented by ungulates, lagomorphs, shrews, moles, and others. Mammals are associated with specific habitats that offer suitable forage and refuge; patterns of use vary with seasonal food availability. Areas are diverse in composition, structure, and ecological succession stage; mosaics of cover types and the ecotones between them enhance prey density and other food opportunities. Most hollow logs, snags, brush piles, or rock outcrops are acceptable dens for rodents and carnivores, but the caves used by some bats must meet precise temperature and humidity conditions. Mammals associated with aquatic habitats use estuaries, marshes, and streams. Terrestrial habitats include desert, prairie, savanna, and agricultural fields. In the mountains, high-elevation habitats (such as spruce-fir and northern hardwood forests) are important to the long-tailed shrew (Sorex dispar); in coastal areas, bottomland hardwoods and cypress swamps support the swamp rabbit (Sylvilagus aquaticus). The peak number of mammal species (148) occurs in the Mid-South, where rodent (68), bat (38), and carnivore (22) diversity occur in highest numbers (fig. 14.7). Second is the Coastal Plain (103 species), which supports the most species categorized as “other mammals” (24 species) by NatureServe. The next tier is led by the Appalachian-Cumberland highlands (77 species), Piedmont (76 species), and Mississippi Alluvial Valley (61 species). The distribution of mammal diversity across the region highlights patterns in two quite different subregions: the Mid-South and the Appalachian-Cumberland highlands (fig. 14.8). Of particular importance is the West Texas Basin and Range section, which is located on the Mexican border and provides habitat for 99 mammal species. Together, the four Mid-South sections support the highest richness of rodents ranging from 57 species in the High Plains to 27 species in the Ozark-Ouachita Highlands. Characteristic rodents from these sections include the cactus deermouse (Peromyscus eremicus), Chihuahuan pocket mouse (Chaetodipus eremicus), Mexican ground squirrel (Spermophilus mexicanus), Southern Plains woodrat (Neotoma micropus), and Texas antelope squirrel (Ammospermophilus interpres). 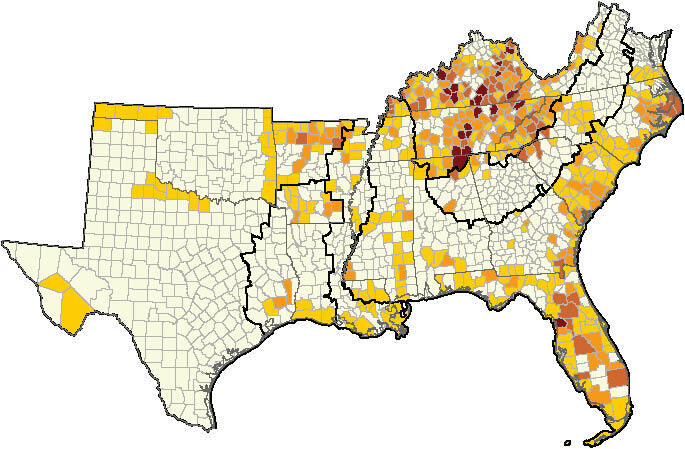 Bat richness is also greatest in the Mid-South, with the High Plains (25 species) and West Texas Basin and Range (24 species) supporting the southern yellow bat (Lasiurus ega), spotted bat (Euderma maculatum), Yuma myotis (Myotis yumanensis), and other species. Carnivore richness is highest in the band from southcentral Texas (17 species) expanding westward through the Western Gulf (15 species). Unique western carnivores include the ocelot (Leopardus pardalis), western spotted skunk (Spilogale gracilis), and white-nosed coati (Nasua narica). Each remaining area in the South supports a range of 10 to12 carnivores. Mammal richness is also notable in the Appalachian-Cumberland highlands, which encompasses a much smaller area than the Mid-South but supports 16 bat species including the eastern small-footed myotis (Myotis leibii), gray myotis (Myotis grisescens), and Virginia big-eared bat (Corynorhinus townsendii virginianus). There are 28 rodent species within mountainous areas providing habitat for the Allegheny woodrat (Neotoma magister), red squirrel (Tamiasciurus hudsonicus), and southern bog lemming (Synaptomys cooperi). The Central Appalachian Piedmont (20 species) and Blue Ridge (18 species) support the largest number of “other mammals,” which include the American water shrew (Sorex palustris), Appalachian cottontail (Sylvilagus obscurus), hairy-tailed mole (Parascalops breweri), and long-tailed shrew among others. 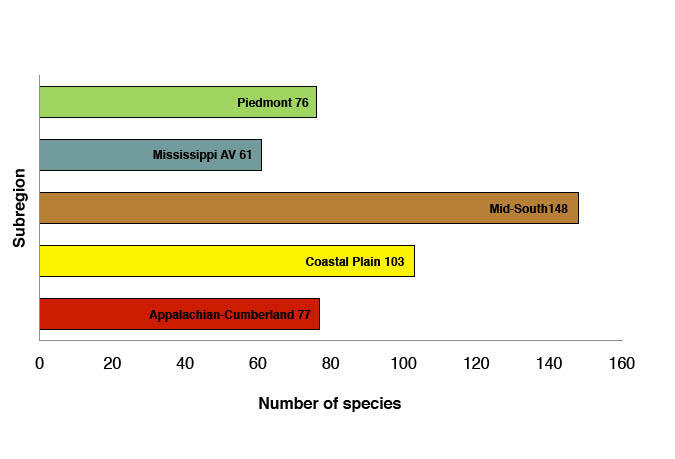 Figure 14.7—Richness of mammal species by subregion in the South. Reptiles—The South supports 196 reptile species (NatureServe 2011), including snakes (90), lizards (53), turtles (50), crocodilians (2), and worm lizards (1). The major subgroups of snakes are nonvenomous snakes, coral snakes, and pit vipers; species that inhabit the water are especially prevalent. Two of the largest snakes in North America occur in the region: the eastern indigo snake (Drymarchon couperi) and eastern diamond-backed rattlesnake (Crotalus adamanteus). The four lizard subgroups include anole lizards, fence lizards, collared lizards, horned lizards, whiptails, skinks, and glass lizards. The turtle group consists of sea turtles, snapping turtles, box turtles, mud and musk turtles, tortoises, and soft-shell turtles. The two crocodilians are quite well-known: the American alligator (Alligator mississippiensis) and American crocodile (Crocodylus acutus). The fossorial worm lizard (Rhineura floridana), despite its name and appearance, is an Amphisbaenian and does not belong in either the snake or the lizard group. With the exception of lizards, the all reptiles reach their maximum species richness in the South (Bailey and others 2006). As with amphibians, ecological importance of lizards has become recognized in the past decade as resource objectives focus on biodiversity conservation, landscape perspectives, and their role in ecosystem functioning. Reptiles occupy a variety of habitats including mesic and xeric hardwood forests, sandhills, grasslands, prairies, barrens, outcrops, beaches and dunes, agricultural and urban areas (Bailey and others 2006). Rivers, streams, swamps, lakes, and marshes figure prominently in aquatic turtle occurrence. Groups such as mud turtles (Kinosternon spp.) use terrestrial habitat for nesting and winter dormancy, spending the summer in wetland areas. The forested mountain areas support an abundance of reptiles including the bog turtle (Glyptemys muhlenbergii), while the longleaf pine-wiregrass community is vital habitat for the gopher tortoise (Gopherus polyphemus) and glass lizard (Ophisaurus spp.). Cypress-gum swamps support several species (Gibbons and Buhlmann 2001) including the rainbow snake (Farancia erytrogramma) and striped crawfish snake (Regina alleni). Leaf litter and fallen logs provide shelter and foraging opportunities; friable soils are an important habitat component for many. The Mid-South (148 species) leads in reptile richness (fig. 14.9), where snake (74) and lizard (45) species occur in the highest numbers. The diversity of this subregion reflects its large size and strategic location at the crossroads of several distinct reptilian fauna (Stein and others 2000). Many eastern reptiles reach their westernmost distribution in the Mid-South, while the converse is also true for western reptiles. Second in reptile richness is the Coastal Plain (129), which supports the most turtle species (43) in its abundant coastal and freshwater habitats. The third tier is comprised of the Piedmont (75), Mississippi Alluvial Valley (72), and Appalachian-Cumberland highlands (60). The distribution of reptile diversity is concentrated across the southern portion of the region, with notable differences among the various groups (fig. 14.10). Lizard richness is highest in the western sections of three Mid-South sections—High Plains (38), West Texas Basin and Range (35), and Cross Timbers (25)—reflecting availability of arid habitats. These three sections provide habitat for the Texas spotted whiptail (Aspidoscelis gularis), eastern collared lizard (Crotaphytus collaris), round-tailed horned lizard (Phrynosoma modestum), and canyon lizard (Sceloporus merriami). Snakes are quite diverse in both the eastern and western portions of the region. The High Plains (64), Cross Timbers (58), and West Texas Basin and Range (43) sections support the Chihuahuan hook-nosed snake (Gyalopion canum), prairie rattlesnake (Crotalus viridis), and Texas threadsnake (Leptotyphlops dulcis). The Southern Gulf (48), Eastern Atlantic (42), and Florida Peninsular (40) sections are inhabited by the cottonmouth (Agkistrodon piscivorus), Florida crowned snake (Tantilla relicta), and southern watersnake (Nerodia fasciata). The Southern Gulf supports the maximum diversity of turtles (34) including the Alabama map turtle (Graptemys pulchra), Pascagoula map turtle (Graptemys gibbonsi), and Peninsula cooter (Pseudemys peninsularis). Other notable Coastal Plain areas inhabited by a variety of turtles include the Eastern Atlantic (23), Middle Gulf-Eastern (23), and Florida Peninsular (21). Characteristic species include the common musk turtle (Sternotherus odoratus), eastern box turtle (Terrapene carolina), southern painted turtle (Chrysemys dorsalis), and spiny softshell (Apalone spinifera). 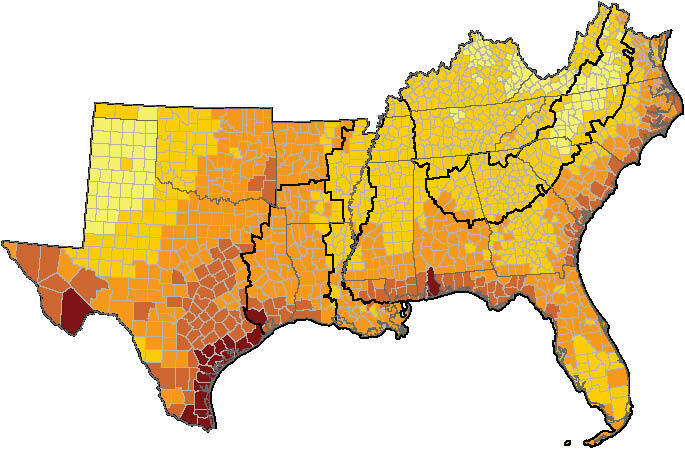 Figure 14.9—Richness of reptile species by subregion in the South. 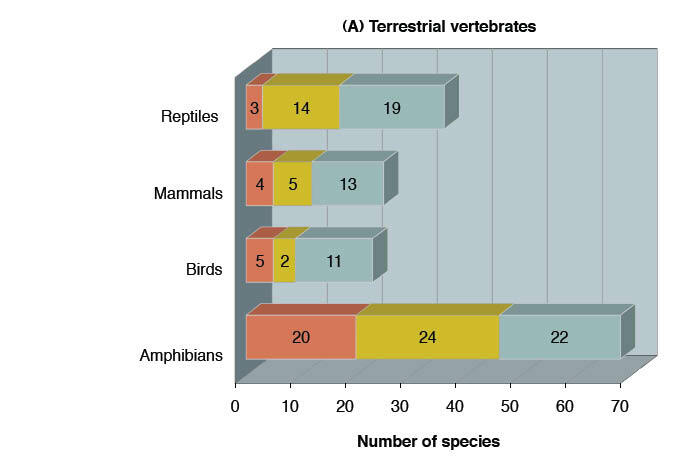 Figure 14.11 displays the distribution of 77 vertebrate species listed as threatened or endangered by the U.S. Fish and Wildlife Service in the South. There is an evident pattern of endangerment along the Atlantic Ocean coast extending from North Carolina to Florida and along the Gulf of Mexico westward to Louisiana, with pockets along the southern coast of Texas. The Coastal Plain leads with the number of threatened or endangered vertebrates (62 species), with heaviest concentrations occurring in Peninsular Florida, Southern Gulf, and Eastern Atlantic areas (table 14.3). The Mid-South is second, with 33 listed species, the majority occurring within the High Plains and Cross Timbers sections. The remaining subregions have 10 or fewer vertebrate species with Federal status. They are described by taxa in the next section of this chapter. Coastal regions, especially the Cape Fear area of North Carolina, the tip of Florida, and the Gulf of Mexico from Florida westward to Louisiana, also have concentrations of the 141 threatened or endangered vascular plant species (fig. 14.12). In addition, pockets of listed plant species occur in the Lake Wales Ridge in central Florida, Southern Blue Ridge and escarpment in the Carolinas, and the Big Bend region of the West Texas Basin and Range. With 60 species, the Coastal Plain leads in threatened or endangered vascular plants (table 14.4). The Appalachian-Cumberland highlands are second (35 species), followed by the Piedmont (24), Mid-South (21), and Mississippi Alluvial Valley (1). bT = Threatened; E = Endangered; SAT = Similarity of Appearance to a Threatened taxon. cLocation data from NatureServe (2010). d1_1 (Northern Atlantic); 1_2 (Eastern Atlantic); 1_3 (Florida Peninsular); 1_4 (Southern Gulf); 1_5 (Middle Gulf-Eastern); 1_6 (Middle Gulf-Western); 1_7 (Western Gulf); 2_1 (Central Appalachian Piedmont); 2_2 (Southern Appalachian Piedmont); 2_3 (Piedmont Ridge, Valley and Plateau); 3_1 (Blue Ridge); 3_2 (Northern Ridge and Valley); 3_3 (Southern Ridge and Valley); 3_4 (Cumberland Plateau and Mountain); 3_5 (Interior Low Plateau); 4_1 (Holocene Deposits); 4_2 (Deltaic Plain); 5_1 (Ozark-Ouachita Highlands); 5_2 (Cross Timbers); 5_3 (High Plains); 5_4 (West Texas Basin and Range). eListed endangered in the breeding colony population in Florida; threatened elsewhere. aSpecies names follow USDA NRCS Plants Database (2010). Amphibians—Nine species of amphibians are listed as threatened or endangered; the list is dominated by salamanders in the Coastal Plain and Mid-South (table 14.3). Species of special concern include the Houston toad (Bufo houstonensis), Barton Springs salamander (Eurycea sosorum), reticulated flatwoods salamander (Ambystoma bishopi), Shenandoah Mountain salamander (Plethodon shenandoah), and Texas blind salamander (Eurycea rathbuni). These species have physiological constraints and complex life cycles that limit them to moist habitats, restricted geographic ranges, and site fidelity. Contributing to their imperilment are thermal changes, water pollution, and excessive siltation in their aquatic habitats (Wilson 1995). Wetland alteration from dredging, channelization, and impoundment is also detrimental to many of these species. Other factors include invasive animal species, acid precipitation, and ultraviolet radiation. Population isolation inhibits dispersal; many amphibians are adapted to travel only short distances, limiting their ability to find similar locales in response to habitat alteration (Gibbons and Buhlmann 2001). Birds—Twenty-two species of birds are listed as threatened or endangered (table 14.3). Seventeen of these species inhabit the Coastal Plain and 12 in the Mid-South. Species of concern include the Cape Sable sparrow (Ammodramus maritimus mirabilis) and the Eskimo curlew (Numenius borealis). Many of these species are experiencing habitat loss, habitat fragmentation, and coastal development (Trani 2002a). Habitat for Audubon’s crested caracara (Polyborus plancus audubonii) is being degraded by large-scale conversion of native range and pasture to citrus groves. The dependence on breeding and stopover habitats along migration routes has placed several bird species at risk in areas where habitat alteration is occurring. Drainage and channelization projects impact wetland species such as the wood stork (Mycteria americana) and snail kite (Rostrhamus sociabilis plumbeus). Mammals—Twenty-eight species of mammals are listed as threatened or endangered (table 14.3). Twenty listed mammals occur in the Coastal Plain, eight in the Mid-South. The list is dominated by 13 rodents, including Carolina and Virginia northern flying squirrels (Glaucomys sabrinus coloratus, G. s. fuscus) and southeast beach deermouse (Peromyscus polionotus niveiventris). Other species of concern include the Louisiana black bear (Ursus americanus luteolus) and Indiana myotis (Myotis sodalis). These species are experiencing habitat fragmentation, land-use conversion, population isolation, road mortality, and coastal development (Harvey and Saugey 2001, Trani and others 2007). Human disturbance to hibernation and maternity colonies is a major factor in bat declines (Trani 2002a). Some rodent species have narrow distributions such as beach habitats, where feral cats represent a significant threat (McCay 2007, White and others 1998). Habitat destruction and the paucity of large tracts of land free from human harassment threaten large, far-ranging mammals such as American black bear and Florida panther (Puma concolor coryi) that require extensive home ranges (Crawford and others 2001, Pelton 2001). Reptiles—Table 14.3 lists 18 species of reptiles as threatened or endangered including 14 in the Coastal Plain and six inhabiting the Mid-South. The list is dominated by 11 turtles. Reptiles of concern include the leatherback (Dermochelys coriacea), eastern indigo snake, and sand skink (Plestiodon reynoldsi). The American alligator is designated as threatened due to “Similarity of Appearance” to the American crocodile (U. S. Department of the Interior 2011). Due to an ectothermic physiology and seasonal inactivity, reptiles have relatively slow growth rates and advanced ages at maturity, factors that exacerbate environmental risks. Imperilment factors include illegal and unregulated collecting of reptiles, land development, intentional killing, degradation of aquatic habitats, and fire suppression (Ernst and others 1994, Gibbons and Buhlmann 2001, Rudolph and Burgdorf 1997, Semlitsch and Bodie 1998, White and others 1998). The 77 threatened or endangered vertebrates and 141 threatened or endangered plants represent a portion of southern species considered to be at risk. The databases of the State Heritage Agencies contributed to an additional regional list of species of conservation concern; this list was based on rarity throughout the complete range where a species occurs (table 14.1). The list consists of 142 vertebrates and 942 plant species (fig. 14.13). Among terrestrial vertebrates, 32 species (22 percent) are classified as critically imperiled, 45 species (32 percent) as imperiled, and 65 species (46 percent) as vulnerable. The proportion of species at risk varies among taxonomic groups, with amphibians comprising 46 percent of imperiled species, followed by reptiles (25 percent), mammals (16 percent), and birds (13 percent). 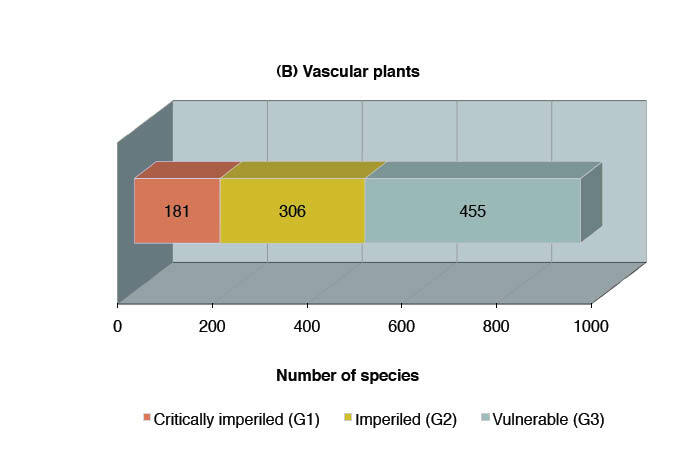 Among vascular plants, 181 (19 percent) are critically imperiled, 306 (32 percent) are imperiled, and 455 (46 percent) are vulnerable. 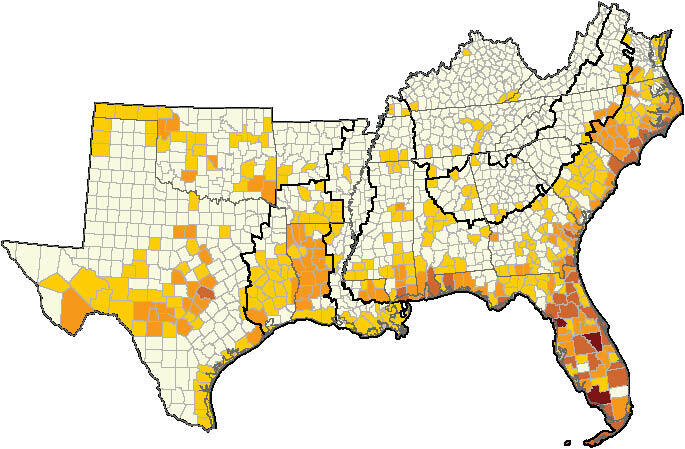 Figures 14.14 and 14.15 display the geographic distribution of species of concern across the South. For vertebrates (fig. 14.14), there appears to be geographic coincidence with the Federal status map, particularly in the importance of areas along the Atlantic and Gulf coasts, with Peninsular Florida and Southern Gulf sections as locations of serious conservation concern. However, it also provides an additional perspective on the geography of risk, pointing to locations that are emerging as new areas of concern. These include the Appalachian-Cumberland highlands (Blue Ridge, Southern Ridge and Valley, Cumberland Plateau and Mountain, and Interior Low Plateau sections) and the Mid-South (Ozark-Ouachita Highlands and West Texas Basin and Range sections, and Edwards Plateau in central Texas). In terms of subregion, the Coastal Plain (64 vertebrate and 532 plant species) and Mid-South (55 vertebrate and 321 plant species) lead in the number of species of concern followed by the Appalachian-Cumberland highlands (31 vertebrate and 207 plant species) and Piedmont (29 vertebrate and 188 plant species). Nine imperiled vertebrate and 20 plant species inhabit the Mississippi Alluvial Valley. Although several of these hot spots are shared by several species, there are interesting differences among the taxa that are described below. 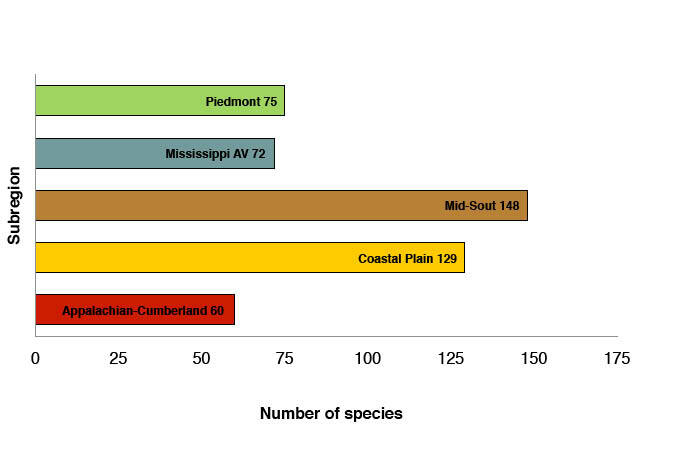 Figure 14.13—Number of species at risk in the South for (A) terrestrial vertebrates and (B) vascular plants. Amphibians—Sixty-six amphibian species are of conservation concern (table 14.5). Salamanders dominate with 62 listings, followed by frogs and toads with 4 listings. 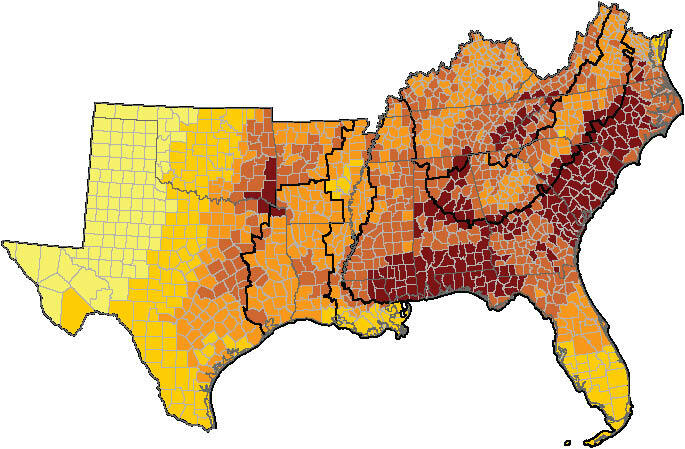 Amphibians at risk occur in heaviest concentrations across the Appalachian-Cumberland highlands, Coastal Plain, and Mid-South (fig. 14.16). Numbers of imperiled amphibians are prominent in the Blue Ridge (15 salamanders) where they are affected by habitat degradation, water pollution, drought, and acid rain. Characteristic species include the Blue Ridge gray-cheeked salamander (Plethodon amplus), Tellico salamander (Plethodon aureolus), and hellbender (Cryptobranchus alleganiensis). Also important in supporting species at risk are the High Plains (12 species) and Southern Gulf (11 species). These areas provide important habitat for the dusky gopher frog (Rana sevosa), Florida bog frog (Rana okaloosae), and striped newt (Notophthalmus perstriatus). Threats to these species include loss of longleaf pine, agricultural and urban development, fire exclusion, contamination of springs, introduction of nonnative fish into breeding ponds, and stream impoundment. aG1 = Critically imperiled; G2 = Imperiled; G3 = Vulnerable. b1_1 (Northern Atlantic); 1_2 (Eastern Atlantic); 1_3 (Florida Peninsular); 1_4 (Southern Gulf); 1_5 (Middle Gulf-Eastern); 1_6 (Middle Gulf-Western); 1_7 (Western Gulf); 2_1 (Central Appalachian Piedmont); 2_2 (Southern Appalachian Piedmont); 2_3 (Piedmont Ridge, Valley and Plateau); 3_1 (Blue Ridge); 3_2 (Northern Ridge and Valley); 3_3 (Southern Ridge and Valley); 3_4 (Cumberland Plateau and Mountain); 3_5 (Interior Low Plateau); 4_1 (Holocene Deposits); 4_2 (Deltaic Plain); 5_1 (Ozark-Ouachita Highlands); 5_2 (Cross Timbers); 5_3 (High Plains); 5_4 (West Texas Basin and Range). Birds—Eighteen avian species are of conservation concern (table 14.6). The breakdown along subtaxa is 3 wading and shorebirds, 7 perching birds, and 8 others. Species include the Kirtland’s warbler (Dendroica kirtlandii), golden-cheeked warbler (Dendroica chrysoparia), Fea’s petrel (Pterodroma feae), and lesser prairie chicken (Tympanuchus pallidicinctus). Bird species at risk occur predominately along the Atlantic Ocean extending from southern Virginia to Florida and continuing along the Gulf of Mexico across Louisiana to the southernmost tip of eastern Texas (fig. 14.17). Highest numbers occur in the Cross Timbers (7 species) and High Plains (6 species) sections of the Mid-South. Species such as the piping plover (Charadrius melodus) are vulnerable to disturbance of nesting areas, declining fish populations, oil spills, and extreme weather conditions. The black-capped vireo (Vireo atricapilla) is vulnerable to cowbird parasitism and loss of nesting habitat from housing development, road construction, and over-browsing by domestic livestock. Peninsular Florida supports six birds at risk, including the Florida scrub jay (Aphelocoma coerulescens) and wood stork. Conservation concerns center on rapidly growing population centers and habitat conversion to urban and agricultural uses (such as sugarcane and citrus production). Imperiled birds also occur in the Eastern Atlantic, Southern Gulf, and Western Gulf sections; these species include the whooping crane (Grus americana) and red-cockaded woodpecker (Picoides borealis). Threats to birds in these areas include conversion of longleaf pine and upland hardwoods to other uses, hydrological alteration, and coastal development. Mammals—Twenty-two mammal species are imperiled or vulnerable (table 14.7). Rodents dominate with 8 listings, followed by bats (7), carnivores (4), and others (3). Species include the Texas kangaroo rat (Dipodomys elator), Strecker’s pocket gopher (Geomys streckeri), red wolf (Canis rufus), and jaguar (Panthera onca). 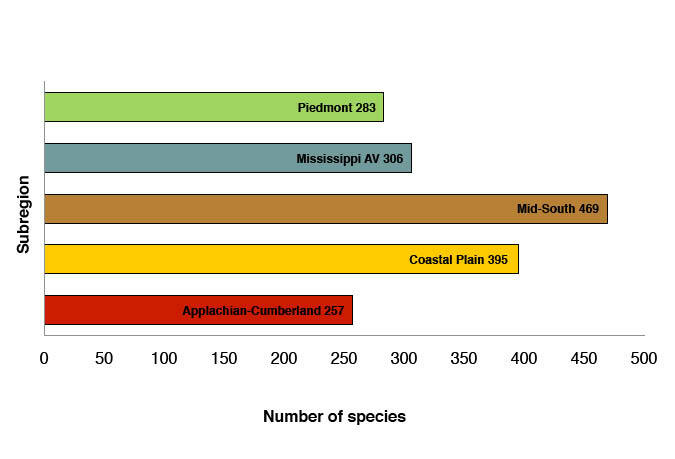 Although the Coastal Plain (10 species) and Mid-South (9 species) support the largest number of imperiled mammals (fig. 14.18), it is the Appalachian-Cumberland highlands where the majority of hot spots occur. Numbers of imperiled mammals are particularly prominent in Oklahoma and Tennessee in the Interior Low Plateau, Cumberland Plateau and Mountain, Southern Ridge and Valley, and in the Blue Ridge of North Carolina. Species occurring in these sections include the eastern small-footed myotis, Carolina and Virginia northern flying squirrels, and Virginia big-eared bat. The Ozark-Ouachita Highlands are also notable, supporting the Ozark big-eared bat, southeastern myotis (Myotis austroriparius), and several other bat species. Cave disturbance, vandalism, and destruction of roost sites imperil these species, as does habitat loss stemming from deforestation and stream channelization. Threats to other mammals in these areas include insect pests (such as balsam wooly adelgid, gypsy moth), acid rain which contaminates mycorrhizal food sources, and heavy metals in forest litter. Habitat fragmentation has resulted in population isolation and the loss of dispersal and travel corridors. Peninsular Florida and the northern portion of the Eastern Atlantic are also important for mammals at risk, supporting the round-tailed muskrat (Neofiber alleni), Florida deermouse (Podomys floridanus), and West Indian manatee (Trichechus manatus). Threats to these species include loss of wetlands, marsh drainage, and salt water intrusion—all of which reduce available habitat and further isolate populations. For the manatee, the potential loss of warm-water refugia from residential and commercial development of coastal land remains a problem. Reptiles—Thirty-six reptile species are of conservation concern (table 14.8). Nineteen are oceanic and map turtles (53 percent), followed by snakes (9), lizards (7), and crocodilians (1). Representative species include the southern hog-nosed snake (Heterodon simus), loggerhead (Caretta caretta), gopher tortoise, and alligator snapping turtle (Macrochelys temminckii). The Coastal Plain supports more reptiles at risk (27 species) that the other four subregions combined (fig. 14.19). The highest concentration of imperiled turtles occurs in the Southern Gulf (13 species), Eastern Atlantic (7 species), and Florida Peninsula (7 species). The occurrence of imperiled snakes is also highest in these three areas but far fewer numbers are involved (3 to 4 species per section). Turtles occurring in these areas include the hawksbill (Eretmochelys imbricata) and Alabama redbelly turtle (Pseudemys alabamensis). Snakes are represented by the Concho watersnake (Nerodia paucimaculata) and Rim Rock crowned snake (Tantilla oolitica). Other reptiles at risk inhabiting these areas include the mimic glass lizard (Ophisaurus mimicus) and bluetail mole skink (Plestiodon egregius lividus). Many reptiles are long-lived, late maturing, and have restricted geographic ranges. For map turtles, those limits magnify the risk from degradation of aquatic habitats, disease, or illegal collection. Sea turtles are imperiled by commercial turtle fishing, exploitation of the juveniles, beach development, and incidental take. Lizard species with insular populations and restricted ranges are at risk to habitat loss. Malicious killing of snakes, as well as biocides and the pet trade, contribute to their imperilment. Plants—Species of conservation concern are concentrated in five areas. One of these is Big Bend National Park in the West Texas Basin and Range, where the Chihuahuan desert ecosystem is home to an endangered perennial herb, Terlingua Creek cat’s-eye (Cryptantha crassipes), and two cacti, Nellie Cory (Escobaria minima) and Davis’s hedgehog (Echinocereus viridiflorus var. davisii). Eastward, the islands, marshes, swamps, and flatwoods of the southern Gulf Coast, especially the Apalachicola area, contain over 150 species of concern, including 12 that are endangered—among them Apalachicola false rosemary (Conradina glabra), Florida nutmeg (Torreya taxifolia), and purpleflower pinkroot (Spigelia gentianoides); and five that are threatened—among them Florida skullcap (Scutellaria floridana) and Telephus spurge (Euphorbia telephioides). Two other regions in Florida, the central ridges and uplands, including Lake Wales Ridge, and much of the area south of Lake Okeechobee, have a number of sensitive species. Sandhills, scrub, flatwoods, bayheads, and hammocks of the Florida central uplands have 21 species listed as endangered or threatened. These include pygmy fringetree (Chionanthus pygmaeus), false rosemary (C. brevifolia), and scrub balm (Dicerandra frutescens). Upward along the Atlantic Coastal Plain, at-risk plants in North Carolina include wet-site species. Examples include the endangered pondberry (Lindera melissifolia) and Canby’s dropwort (Oxypolis canbyi), as well as American chaffseed (Schwalbea americana) and other species of fire-prone ecosystems that occupy pine savannas, bottomland and swamp forests, and scattered pocosin wetlands. Terrestrial vertebrates—The Southern Forest Resource Assessment (Trani 2002b) presented 32 terrestrial species that were classified as extinct or extirpated from the South. In the years following that effort, the databases from State Heritage Agencies (NatureServe 2011) indicate this list has expanded to 65 species (table 14.9). The degree of extirpation species varies among taxonomic groups, with birds comprising 61 percent, followed by mammals (28 percent), reptiles (6 percent), and amphibians (5 percent). Recent extirpation was most prominent in the perching bird and wading bird groups. Nine perching species have been lost from six States. Henslow’s sparrow (Ammodramus henslowii) has experienced population and range reductions due to habitat alteration (urban growth and industrial development), while the bobolink (Dolichonyx oryzivorus) decline has been attributed to incompatible agricultural practices (NatureServe 2011). There appears to be a pattern among extirpated wading birds that reflects the continuing loss and modification of wetland habitat in the South. The American bittern (Botaurus lentiginosus) is threatened by the degradation of wetlands due to drainage, siltation, and conversion to agriculture; the wood stork has been negatively impacted by human alteration of natural hydrological conditions that affect both nesting and feeding areas. The white-faced ibis is also vulnerable to fluctuating water levels, habitat alteration, and pesticide contamination. Also notable is the first appearance of extirpated bat species on the list since the Southern Forest Resource Assessment. Populations of the Northern myotis (Myotis septentrionalis) in the South are small and widely dispersed; the philopatry displayed by this bat for winter roosts may lead to local extirpation if a hibernaculum is modified or destroyed (Chapman 2007). The Indiana myotis is quite vulnerable to natural and human-caused disturbance due to concentrated populations in few winter hibernacula. Population declines have also been attributed to destruction of summer foraging and roosting habitat by deforestation and stream channelization (Ford and Chapman 2007). Carnivore species (10) remain the largest group of extirpated mammals in the South. The extirpation of large carnivores such as the gray wolf (Canis lupus) reflects the history of European settlement (Trani 2002b) where they were regarded as threats to livestock and personal safety. The decline of the red wolf has been attributed to indiscriminate predator control, extensive land clearing, and coyote (Canis latrans) hybridization (Trani and Chapman 2007). The disappearance of the jaguar reflects habitat destruction, illegal hunting, and exploitation by the fur industry (NatureServe 2011). Other carnivores such as the cougar (Puma concolor) were relegated to relatively remote areas. Recent extirpation of reptile species occurred in four States. The mimic glass lizard has a disjunct distribution in the South; it is vulnerable to habitat loss from development, conversion to pine plantations, and road mortality. Snakes comprise three-fourths of the State-level reptile extirpations. The Southern hog-nosed snake is declining throughout most of its range in the Coastal Plain; potential threats include fire ants, intensive agricultural/silvicultural activities, widespread pesticide application, and road mortality. Frogs and toads are new to the list of extirpated amphibian species since the Southern Forest Resource Assessment. The dusky gopher frog formerly occurred in the Coastal Plain from Alabama to Louisiana; it is now known from a small area in Mississippi and threatened by habitat degradation (NatureServe 2011). Vascular plants—The 550 extirpated plant species listed by NatureServe (2011) databases include those within 74 vascular plant families (table 14.10). Habitat loss has reduced the range of species associated with unique plant communities or those found in areas subject to development. Climate change may cause further reduction in species range. For example, seaside heliotrope (Heliotropium curassavicum var. curassavicum), a plant of salt flats and marshes in the South, has disappeared from North Carolina, likely due to past coastal development, and may be threatened in the future by sea level rise in other Southern States (chapter 13). Other obligate and facultative freshwater wetland plants, including four bladderwort (Utricularia) species, have disappeared from selected States. Plants of locally unique areas such as glades, savannas, and prairie-like sites (e.g., yellow flax (Linum sulcatum), entire leaf Indian paintbrush (Castilleja indivisa), and American columbo (Frasera caroliniensis), have been extirpated from some States, especially where the habitat is sparse or at the edge of the range. Plant species that were initially known from single sporadic locations, or are inconspicuous may easily be overlooked in field surveys. This includes the southern (Listera australis) and heartleaf (L. cordata) twayblades orchids, possibly extirpated from Kentucky and North Carolina, respectively. On the other hand, showy or specialized plants such as selected orchids may be lost through habitat reduction and exploitation. These include species in the genus Platanthera: Chapman’s fringed orchid (P. chapmanii - Presumed extinct Georgia); white fringeless orchid (P. integrilabia - Presumed extinct North Carolina); eastern prairie white-fringed orchid (P. leucophaea - Presumed extinct Oklahoma); snowy orchid (P. nivea - Presumed extinct Arkansas), and purple fringeless orchid (P. peramoena - Presumed extinct South Carolina). Harvesting from the wild may lead to increasing rates of extirpation of economically important plants if market demands increase faster than the supplies from garden populations. Mid-South—In Arkansas, the Ozark-Ouachita Highlands region around Hot Springs and Little Rock is predicted to experience 10 to 20 percent forest loss and an equal percentage of urban growth. This area includes Hot Springs National Park and the Ouachita National Forest. Forest and glade plants that could be threatened on unprotected lands in this westernmost area include the vulnerable southern lady’s slipper (Cypripedium kentuckiense) reported by Case and others (1998), the clasping twistflower (Streptanthus maculatus), and least trillium (Trillium pusillum) reported by Timmerman-Erskine and others (2003). Urban growth in this subregion is forecast for counties that support the Caddo Mountain salamander (Plethodon caddoensis), the Ozark big-eared bat (Corynorhinus townsendii ingens), and the Oklahoma salamander (Eurycea tynerensis). Additional Mid-South development along the southern borders shared by Cross Timbers and Western Gulf could impact a numerous reptiles, especially Cagle’s map turtle (Graptemys caglei), loggerhead, and other turtles. This area also lies within a band of especially high avian richness that occurs along the Texas Gulf Coast of the Central Flyway. Appalachian-Cumberland highlands—Ten to twenty-five percent urban growth and 10 to 20 percent forest loss near Nashville in the Interior Low Plateau and around Knoxville and Asheville in the Blue Ridge section could threaten bats, salamanders, and concentrations of sensitive plant species. The central Tennessee basin, adjacent escarpment, and highland rim around Nashville have plants of limestone glades, prairie-like areas, and forests. These include the endangered Pyne’s ground plum (Astragalus bibullatus) and Tennessee coneflower (Echinacea tennesseensis), which are endemic to central basin limestone glades (Baskin and Baskin 2005, Snyder and others 1994). In eastern Tennessee and western North Carolina, forest loss, increased recreational use and residential development near Knoxville and Asheville threaten to reduce the high biodiversity of the Southern Appalachian Mountains. Warmer temperatures may allow migration of southern species into lower elevation sites. Even though large public land holdings (Great Smoky Mountain National Park, Blue Ridge Parkway, and Nantahala, Pisgah, and Cherokee National Forests) buffer and protect these habitats, residential development and growing recreational use threaten plant species such as the endangered spreading avens (Geum radiatum), which is endemic to high elevation rock outcrops, grassy balds, and cliff faces (Murdock 1993). Warmer temperatures, changes in precipitation or fire regime, or climate-change induced competition from offsite plants may threaten spreading avens (Godt and Hamrick 1995; Murdock 1994), along with other species of high elevation and unique habitats such as the vulnerable false dandelion (Krigia montana) on cliffs, outcrops, and grassy balds; the vulnerable Rugel’s ragwort (Rugelia nudicaulis) of spruce forests; and the endangered Smoky Mountains mannagrass (Glyceria nubigena) of high elevation seeps. The Blue Ridge supports a notable 53 species of salamanders, 15 of which are imperiled or vulnerable: dwarf black-bellied salamander (Desmognathus folkertsi), red-legged salamander (Plethodon shermani), and South Mountain gray-cheeked salamander (Plethodon meridianus). Any loss of habitat connectivity will make migration difficult for the amphibians that occur there. Piedmont—Forecasts of substantial urban growth (10 to 25 percent), with substantial losses of forest habitat, could impair the relatively high richness of amphibians (59 to 76 species/section) and mammals (49 to 58 species/section) that inhabit this subregion. Several species of concern occur in the Central Appalachian Piedmont (14), Southern Appalachian Piedmont (18), and Piedmont Ridge and Valley (17), including the black warrior waterdog (Necturus alabamensis), gray myotis, Peaks of Otter salamander (Plethodon hubrichti), and Shenandoah Mountain salamander. The greater than 25 percent urban growth predicted for Atlanta, particularly expansion along Interstate 85 northward toward Greenville, SC, could threaten plants of upland forests and openings, such as American ginseng (Panax quinquefolius). However, more than 75 percent of at-risk plant species in the fast-growing DeKalb and Gwinnett counties around Atlanta are either associated with protected lands or with areas that are otherwise inaccessible for development (e.g., granite outcrops). 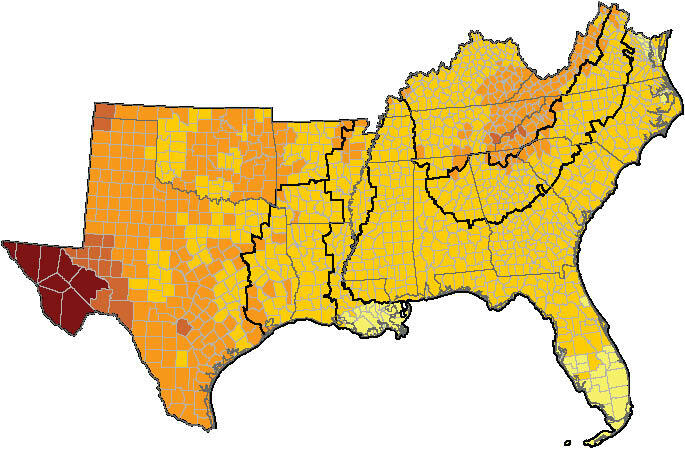 Areas with concentrations of sensitive plant species or plant communities—including the Blue Ridge escarpment and foothills (Southern Appalachian Piedmont), and southern extensions of the Cumberland Plateau and adjacent Valley and Ridge (Piedmont Ridge, Valley and Plateau)—are predicted to have 3 to 20 percent increase in urban area and forest loss. The escarpment and foothills area, primarily in northern South Carolina, includes mountain outcrops such as Table Rock State Park, gorges, lakes (such as Jocassee, Keowee, and Hartwell), the Chattooga Wild and Scenic River, and the growing urban area around Greenville. Beyond protected public lands, development threatens plants such as the imperiled Oconee-bells (Shortia galacifolia) in ravines and shady streambanks. Plants at risk from habitat loss in the Piedmont Ridge and the Valley and Plateau section of northern Alabama and Georgia include the endangered Alabama leather-flower (Clematis socialis) that occurs along roadsides and recently logged forests (Trusty and others 2009). Coastal Plain—The forecast of a 3 to 25 percent forest loss with subsequent urban development, especially along the Atlantic and Gulf coasts, threatens wildlife and their habitats. Areas close to the coast also are at risk of storm surges and the greater salinity that accompanies sea level rise (chapter 13). For example, seabeach amaranth (Amaranthus pumilus) on barrier island dunes is threatened by beach erosion and inundation as well as construction (U.S. Department of the Interior 2011). More extensively, loss of freshwater emergent marsh and pool habitat threatens wildlife such as the marsh rabbit (Sylvilagus palustris) and several waterbirds that depend on these habitats (Erwin and others 2006). Climate change-induced inundation of mangrove forests (e.g., Rhizophora mangle, Avicennia germinans, or Laguncularia racemosa) along the coast of the Coastal Plain may reduce available habitat and nesting substrate for birds such as the frigatebird (Fregata magnificens), mangrove cuckoo (Coccyzus minor), reddish egret (Egretta rufescens), and roseate spoonbill (Ajaia ajaia). Loss of this habitat may also impact the diamondback terrapin (Malaclemys terrapin) and salt marsh snake (Nerodia clarkii). Live oak (Quercus virginiana) maritime forests that occur on Atlantic and Gulf coast barrier islands may also be degraded by predicted sea level rise. These forests serve as important nesting habitat for many birds that feed in aquatic habitats as well as supporting a diversity of winter avifauna. Birds affected by the loss of live oak maritime forests include the boat-tailed grackle (Quiscalus major), fish crow (Corvus ossifragus), great crested flycatcher (Myiarchus crinitus), and northern parula (Parula americana). Other characteristic species of this forest are the broadhead skink (Eumeces laticeps), green treefrog (Hyla cinerea), golden mouse (Ochrotomys nuttalli), and southeastern shrew (Sorex longirostris). Coastal areas also have a mixture of vegetation types, such as fire-maintained wet pine savannas and flatwoods, seeps and pocosins, marshes, swamps, and bottomlands—that are home to diversity of species and are at risk from changing fire regimes and other indirect effects of climate change (chapter 3). One area of at-risk plant diversity is the Cape Fear Arch region of North and South Carolina: LeBlond (2001) lists 22 endemic and another 22 near-endemic plant species such as coastal goldenrod (Solidago villosicarpa) in coastal edge forests and roughleaf loosetrife (Lysimachia asperulifolia) in the ecotone between upland pine forest and pocosin (Sorrie and others 2006) in this region. Along the Eastern Atlantic and Florida coastlines that coincide with portions of the Atlantic Flyway, extensive development will likely eliminate important stopover habitat for spring and fall migrating birds as well as habitat for resident species. This coastline is also an important nesting area for sea turtles such as the leatherback and Kemp’s Ridley (Lepidochelys kempii). This forecast will impact the habitat for 25 species of conservation concern including the red wolf, round-tailed muskrat, and short-tailed snake (Lampropeltis extenuata). The Florida Peninsula, especially around Palm Beach and Miami, is threatened by projected 10 to 25 percent urban growth and also by sea level rise (chapter 13). This area is ecologically diverse and unique; Monroe and Miami-Dade counties include part of the Everglades and are a mix of pine forests, hammocks, beach dune and strand, prairies, cypress swamps, mangroves, and freshwater and saltwater marshes. These counties contain seven plant species listed as threatened or endangered (U.S. Department of the Interior 2011); while most of them may be further threatened by urban growth and sea level rise, marine species such as Johnson’s seagrass (Halophila johnsonii) could expand their range (Virnstein and Hall 2009). The habitat of several aquatic and marsh species in the Everglades may be vulnerable to sea level rise. This includes the common yellowthroat (Geothlypis trichas), greater siren (Siren lacertina), northern harrier (Circus cyaneus), squirrel treefrog (Hyla squirella), and American mink (Mustela vison). The Florida Peninsula also includes the inland Lake Wales Ridge. Although this area is projected to have a moderate (3 to 10 percent) increase in urban area and forest loss, its diverse fire-maintained ecosystems may be more threatened by changing fire regimes that could accompany climate change. The Southern Gulf, which includes the Apalachicola region westward to the tip of Louisiana, is projected for 3 to 25 percent urban growth and forest loss. Near-coastal areas and the southern part of Louisiana also are threatened by direct and indirect effects of sea level rise. Off protected lands, upland plant species such as Apalachicola false rosemary are threatened by disturbances caused by urbanization and other land use changes. Some rare species such as Florida nutmeg are also at risk from pathogens (Schwartz and others 2000). The projected urban growth of the Southern Gulf is coincident with the highest turtle diversity in the region and with especially rich areas of habitat for species such as the Mississippi sandhill crane (Grus canadensis pulla). Forecasts of increased urbanization in Peninsular Florida would affect bird habitat on the Gulf and Atlantic Coasts, as well as the 38 amphibians that occur in the northern areas of the State. Numerous species of conservation concern could be imperiled by future habitat losses: 38 species in the Southern Gulf and 30 species in the Florida Peninsula. Included are the Florida grasshopper sparrow (Ammodramus savannarum floridanus), Florida panther, Key Oryzomys (Oryzomys palustris natator), ringed map turtle (Graptemys oculifera), and yellow-blotched map turtle (Graptemys flavimaculata). Mississippi Alluvial Valley—Portions of the Deltaic Plain are forecast for 10-25 percent urban growth, while the Holocene Deposits are predicted to expand to a lesser degree (3-10 percent). This growth could negatively influence the current richness of shorebirds and waterfowl occurring within the Mississippi Flyway that runs through these sections; the wetlands of Louisiana and Mississippi provide critical stopover habitat for migrating birds crossing the Gulf from South America. Twenty-five species of frogs and toads that inhabit the Deltaic Plain could also be impacted. The projected areas of urban development/forest loss are adjacent to conservation priority areas designated for habitat enhancement for the threatened Louisiana black bear, which are intended to promote bottomland forest connectivity within the landscape (Lower Mississippi Valley Joint Venture Forest Resource Conservation Working Group 2007). Other forest-dependent vertebrate species of concern in this subregion include the American woodcock (Scolopax minor), ivory-billed woodpecker (Campephilus principalis), and several forest interior songbirds including the Swainson’s warbler (Limnothlypis swainsonii). The sea level rise predicted for the Deltaic Plain would inundate the coastal wetland habitat inhabited by numerous species including the American bittern, king rail (Rallus elegans), least bittern (Ixobrychus exilis), and southern cricket frog (Acris gryllus). Overall, southern ecosystems will continue to be threatened by forest loss and urban growth, as well as effects of climate, such as altered fire regimes, sea level rise, and spread of pathogens. Changes in forest communities may occur due to warming and precipitation patterns. Coastal regions, high elevation areas, species of fire-maintained systems (especially near growing urban centers) are especially at-risk. The value of public and private forest lands for the preservation and conservation of these species and their communities will continue to increase in the future. High elevation forests—These forests are distributed above 4,000 feet elevation on the peaks of the Southern Appalachians and northward in the Appalachian–Cumberland highlands. Species include red spruce (Forest Type 123), red spruce/balsam fir (Forest Type 124), eastern hemlock (Forest Type 105), and northern hardwoods consisting of sugar maple/beech/yellow birch (Forest Type 801; Woudenberg and others 2010). They occur in the Allegheny Mountains of the Central Appalachians in east-central West Virginia and west-central Virginia, the northern Blue Ridge of central and northern Virginia, and the southern Blue Ridge of eastern Tennessee, western North Carolina, and limited areas of northern Georgia. High elevation communities are characterized by cool temperatures, relatively high moisture levels within forests, short growing seasons, exposed rock and acidic soils, and extreme weather events. Canopy trees are often misshapen by persistent strong winds. Open (sparse-to-no tree canopy) communities such as heath or grassy balds and rock outcrops are scattered throughout. The distinctive flora includes the vulnerable Rugel’s ragwort, which is restricted to a few counties in the Great Smoky Mountains (USDA National Resource Conservation Service Plants Database 2010), and the imperiled Fraser fir (Abies fraseri), which is recovering from infestation (Moore and others 2008) by the balsam woolly adelgid (Adelges piceae). High elevation forests support several mammals including the fisher (Martes pennanti), snowshoe hare (Lepus americanus), northern flying squirrel, and rock vole (Microtus chrotorrhinus). The golden-crowned kinglet (Regulus satrapa), red crossbill (Loxia curvirostra), saw-whet owl (Aegolius acadicus), and yellow-bellied flycatcher (Empidonax flaviventris) also inhabit this community. Although few reptiles can tolerate these harsh conditions (Bailey and others 2006), there are locally high populations of several salamanders, some of which are endemic habitat specialists with restricted ranges. Species include the Allegheny Mountain dusky (Desmognathus ochrophaeus), imitator salamander (D. imitator), pigmy salamander (D. wrighti), shovel-nosed salamander (D. marmoratus), Southern Appalachian salamander (Plethodon teyahalee), and Weller’s salamander (P. welleri). High elevation forests are threatened by air pollution, heavy metal deposition, acid precipitation (which influences soil and stream chemistry), natural disturbances such as hurricanes and landslides, and housing development on unprotected lands (Moore and others 2008; Turner and others 2003; Wear and Bolstad 1998; White and others, in preparation). Recent pressures include drier, warmer conditions normally associated with climate change (Ibanez and others 2007) and recreational activity that results in soil compaction and physical damage to young trees (Trani 2002b). These forest types occur infrequently in the Forest Inventory and Analysis data that provided the baseline for Forest Future modeling, precluding any accurate predictions of future changes. Nevertheless, if population centers expand and air temperatures warm by 2060 as predicted by several of the forecasts, the pressures that are currently affecting high elevation forests are likely to continue. For example, the Carolina northern flying squirrels that inhabit high elevation spruce, northern hardwoods, and hemlock forests are ceding territory to expanding populations of southern flying squirrels (Glaucomys volans) as well as suffering from human impacts on the size, quality, and connectedness of their habitat (Weigl 2007) and from the infestation of eastern hemlock (Tsuga canadensis) by the hemlock woolly adelgid (A. tsugae). Upland hardwood forests—Cornerstone B forecasts the greatest loss in upland hardwood forests caused by moderate population growth, high urbanization due to strong income growth, and falling timber prices. The forecast is a 14 percent decrease South-wide, although the dominant forest type, oak-hickory forest, is forecast to lose only 1 percent of its area (chapter 5). Upland hardwood forests of the South were established in the 1800s and early 1900s (Lorimer 2001). These forests are aging and, like forests in all subregions except the newly planted Mississippi Alluvial Valley, will see a decrease in acreage of midsuccessional forest and concomitant increase in late successional forest (chapter 5). Forest aging, with increasing tree sizes and canopy development, could benefit interior species that are sensitive to forest fragmentation and habitat patch size; examples include the gray fox, black and white warbler (Mniotilta varia), hooded warbler (Wilsonia citrina), scarlet tanager (Piranga olivacea), and worm-eating warbler (Helmitheros vermivorus). Over longer time intervals, oak-hickory forest species are predicted to increase (Dale and others 2010) or shift northward, decreasing abundance of this forest type in the South (Iverson and others 2008, Prasad and others 2009). In addition, continued forest fragmentation in this heavily-used forest type, microclimate changes associated with climate warming, and greater recreational use of the forest with increasing human population growth, could threaten forest interior species, thereby offsetting the benefits of forest aging. Longleaf pine forests—These forests historically dominated Coastal Plain sites from southern Virginia to eastern Texas. The fire-maintained longleaf pine–grassland ecosystem currently occupies less than 5 percent of its original 30 million acres (Van Lear and others 2005). Now highly fragmented, this diverse, open-canopied ecosystem occurs primarily in the Coastal Plain over gradients from bogs through flatwoods to sand ridges. Community composition varies with soil moisture and geography. Wiregrass and bluestem dominate the herbaceous layer of longleaf pine savanna. The herb layer of wet longleaf pine forests is diverse and includes grasses, wildflowers, and carnivorous plants. In mature communities, the trees are thinly distributed, flat-topped, and have limbless lower trunks. Rare plant species (including 27 plants listed as threatened or endangered by the U.S. Fish and Wildlife Service) occur in embedded wetlands, wetland-upland ecotones, pine flatwoods, savannas, and dry ridges (Van Lear and others 2005). The threatened or endangered plants include the Canby’s dropwort in wetlands and the vulnerable sandhills milkvetch (Astragalus michauxii) in longleaf pine–wiregrass savannas. The longleaf community supports several vertebrates. The red-cockaded woodpecker occurs in the open pinewoods; Bachman’s sparrow (Aimophila aestivalis) breeds in dense, grassy areas with scattered trees. Other avifauna include Henslow’s sparrow, brown-headed nuthatch (Sitta pusilla), and pine warbler (Dendroica pinus). Characteristic mammals include the southern short-tail shrew (Blarina carolinensis), eastern mole (Scalopus aquaticus), Seminole bat (Lasiurus seminolus), nine-banded armadillo (Dasypus novemcinctus), fox squirrel (Sciurus niger), marsh rice rat (Oryzomys palustris), and long-tailed weasel (Mustela frenata; Trani and others 2007). Longleaf pine communities support 74 amphibians and 96 reptiles (Dodd 1995), including the eastern spadefoot (Scaphiopus holbrookii), pine snake (Pituophis melanoleucus), pine woods treefrog (Hyla femoralis), sand skink, and southern hognose snake (Heterodon simus). Longleaf pine forests traditionally have been managed with prescribed fire to promote regeneration and timber yield (Mitchell and others 2006). Today restoration is underway and many of these forests are managed primarily to promote biodiversity and only secondarily for timber yield (Mitchell and others 2006). Cornerstone A (high economic growth and high demand for wood products) predicts the greatest change in longleaf pine forests. Areas of the Coastal Plain, especially from Virginia southward to Georgia, are projected to lose the majority of their longleaf community by 2060 (fig. 14.20). The urban growth forecast under Cornerstone B also threatens the range of longleaf pine communities, particularly in the Southern Gulf, Eastern Atlantic, and northern portion of Peninsular Florida. 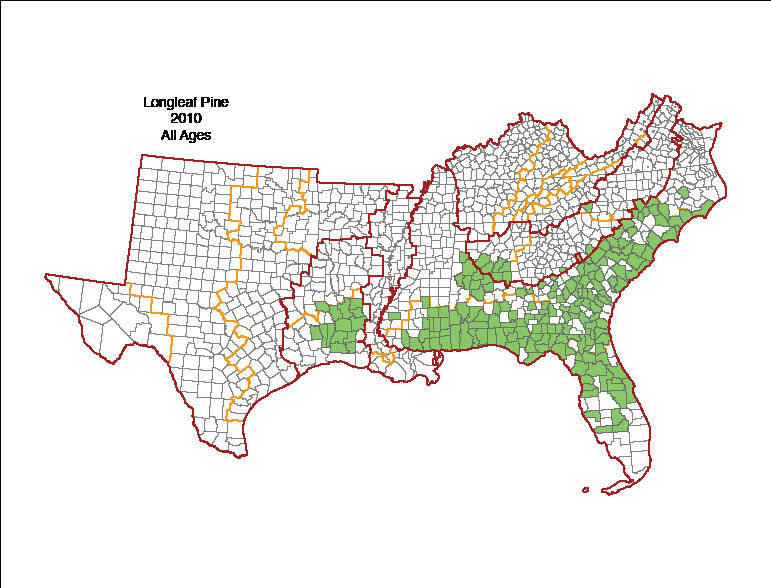 In contrast, other areas are projected for expansion of longleaf pine beyond the current 2010 distribution, potentially enabling associated species to spread or new associations to form. This is notable in south-central Florida and northwest Alabama. 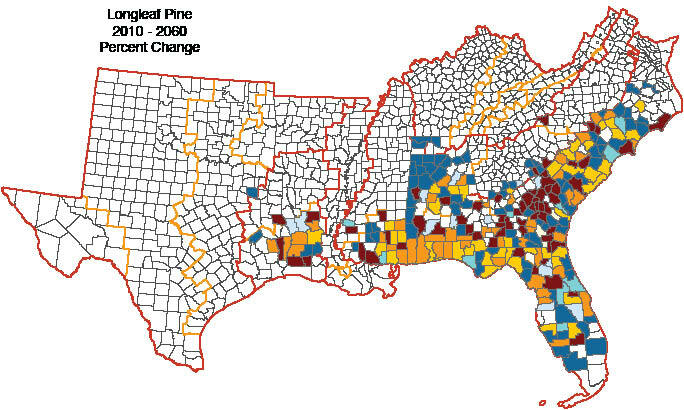 Figure 14.20—Longleaf pine distribution under Cornerstone A’s high-urbanization/high-timber-prices forecast in (A) 2010 and (B) 2060; and (C) percent change for the 50-year period. Early successional forests—Abandoned farmlands, grassland, shrub-scrub, and recently harvested forest are all considered early successional communities (Thompson and DeGraaf 2001). These open habitats are disappearing as abandoned farmland and pastures return to forest, and existing forests mature (Trani and others 2001). Suppression of natural disturbance has also been implicated as has the loss of these habitats to urban growth. Many southern species are associated with early successional or disturbance-dependent environments, and there is rising concern among natural resource professionals about decline of habitat for these specialists (Thompson and DeGraaf 2001), which include the American woodcock, blue-winged warbler (Vermivora pinus), chestnut-sided warbler (Dendroica pennsylvanica), golden-winged warbler (V. chrysoptera), ruffed grouse (Bonasa umbellus), and veery (Catharus fuscescens). Mammals such as the bobcat (Lynx rufus), common gray fox (Urocyon cinereoargenteus), and least weasel (Mustela nivalis) rely on prey associated with early successional habitats. The focus in this section is on young forest habitat (10 years or less). The high-urbanization/high-timber-prices of Cornerstone A forecasts the greatest loss of young forest habitat in the Northern Ridge and Valley section of Virginia, southern Florida and associated Keys, and scattered locations in the Northern Atlantic, Southern Appalachian Piedmont, Blue Ridge, northern Interior Low Plateau, and Mississippi Alluvial Valley (fig. 14.21). The greatest gain in young forest is predicted in the Cumberland Plateau and Mountains and adjacent Southern Ridge and Valley, Apalachicola region of Florida, Ozark-Ouachita Highlands and adjacent northern area of the Mississippi Alluvial Valley, and scattered areas throughout Mississippi and Louisiana. Disturbances that create open-canopy habitat could benefit some forest plant species, such as the imperiled Lesquereux’s mustard (Lesquerella globosa) as reported by the Center for Plant Conservation (2010b). Gain of young forest, especially if accompanied by loss of mature forest, could threaten plants and animals of forest interior and specialized habitats. For example, Lucy Braun’s white snakeroot (Ageratina luciae-brauniae) which lives on wet, shaded cliff ledges and overhangs (Kral 1983), and the endangered Braun’s rockcress (Arabis perstellata) occurring on moist calcareous forest slopes (Center for Plant Conservation 2010a) could be threatened by localized canopy opening, indirect effects of logging, or land clearing. Figure 14.21—Changes in the amount of early successional forest (10 years or younger) of all types from 2010 to 2060 under Cornerstone A’s high-urbanization/high-timber-prices forecast. The richness of species in the South is impressive, with 1,076 native terrestrial vertebrates: 179 amphibians, 525 birds, 176 mammals, and 196 reptiles. Species richness is highest in the Mid-South (856 species in 115 ecosystems) and the Coastal Plain (733 species in 153 ecosystems), reflecting both the large area of these subregions and the diversity of habitats within them. The pattern of species richness varies by taxon. The distribution of amphibians encompasses mountains, highlands, and coastal areas along the Atlantic Ocean and Gulf of Mexico. Bird richness along the coastal areas and wetlands of the Atlantic Ocean and Gulf of Mexico points to the importance of these areas, while mammal richness highlights patterns in the Mid-South and Appalachian-Cumberland. In contrast, the distribution of reptiles is greatest across the southern portion of the region, with notable differences among the various subtaxa. There are 142 terrestrial vertebrate species considered to be of conservation concern in the South; 77 of these are threatened or endangered. However, they are overshadowed by at-risk plants—more than 900 are species of concern and 141 are threatened or endangered. Threats to biodiversity are occurring throughout the region, particularly in the Coastal Plain, Mid-South, and Appalachian-Cumberland highlands. The distribution of threatened or endangered species coincides with areas of serious conservation concern along the Atlantic and Gulf coasts, Peninsular Florida, and Southern Gulf. This pattern has remained relatively stable and has been observed by others using different data sources and criteria (Chaplin and others 2000, Dobson and others 1997, Flather and others 2008, Rutledge and others 2001), which suggests that the geographic extent of identified endangerment locations is not an artifact of any particular data set (Flather and others 2008). There is also a pattern of geographic coincidence between the Federal status and NatureServe ranking schemes for both plants and vertebrates with regard to the Atlantic and Gulf coastal areas and that of Peninsular Florida. However, the NatureServe rankings provide an additional perspective on the geography of risk, pointing to locations that are emerging as new areas of concern: the Appalachian-Cumberland highlands (Blue Ridge, Southern Ridge and Valley, Cumberland Plateau and Mountain, Interior Low Plateau sections) and the Mid-South (Ozark-Ouachita Highlands, West Texas Basin and Range sections, Edwards Plateau in central Texas). The NatureServe ranking scheme also identified five hotspot areas representing threatened or endangered plant diversity: Big Bend National Park in the West Texas Basin and Range, the Apalachicola area of the Southern Gulf Coast, Lake Wales Ridge and the area south of Lake Okeechobee in Peninsular Florida, and coastal counties of North Carolina in the Atlantic Coastal Plain. The Appalachian-Cumberland highlands also contain plant species of concern at the State level. Across all taxa groups, habitat loss and degradation remain the primary threats to maintaining the current number of plant and animal species. Degradation can take the form of environmental contamination (such as water pollution, acid rain, and pesticides) and agricultural, urban, and commercial development (such as channel modification, impoundments, and habitat fragmentation and isolation). Species are also impacted by many other factors such as introduction of forest pests and nonnative plants, disruption of fire regimes, collection, indiscriminant killing, driving off-road vehicles through rare plant communities, caving in maternity bat caverns, and building road networks, power lines, and cell towers. Each species varies in its vulnerability to these threats, and the severity of threats often varies by subregion. Numerous plants and vertebrates are presumed extirpated from selected States in the South; over 50 percent of the terrestrial vertebrates have been added to this list since the time of the Southern Forest Resource Assessment. The causes that factored in species extirpations are, in the majority of cases, the same as those that jeopardize species of conservation concern today. Although the wide-spread land clearing of European settlement is not occurring, dramatic urban growth with accompanying infrastructure development in the South is projected for all subregions. In addition, sea level rise may further reduce the range of plants in coastal estuaries and marshes. Prioritizing conservation and management efforts on areas with concentrations of species of concern may be needed to avert future species losses. New long term strategies are required that focus upon (and mitigate) multiple environmental stressors by incorporating ways to promote landscape connectivity, facilitate species movement, reduce mortality, and increase species viability. In the Mid-South, forest loss and urban growth in the Ozark-Ouachita Highlands threatens forest plant and animal species. Urban development along the southern borders shared by Cross Timbers and Western Gulf could impact a large number of reptiles. In addition, the area lies within a band of especially high avian richness. In the Appalachian-Cumberland highlands, urban growth in the Interior Low Plateau of central Kentucky and Tennessee may threaten wildlife and associated plant species. Forest loss may degrade forest connectivity, hindering migration of amphibians that are at-risk for elimination or displacement. In addition, successful management of the wildland-urban interface will be needed to balance species conservation with anticipated increases in residential development and recreation. And finally, a warming climate threatens species endemic to high elevation outcrops and forests. Substantial urban growth in the Piedmont could reduce the richness of amphibians and mammals. Management of species on public lands may be hindered by the pressure of expanding human populations in surrounding counties, while the smaller (and shrinking) tracts typical of private ownership provide little opportunity for sustainable forest management. Plants in transitional communities, such as the escarpment and foothills of northern South Carolina or southern extensions of the Plateau in northern Alabama and adjacent Georgia, also are at-risk from habitat loss and climate change. Urban growth in the Deltaic Plain Section at the mouth of the Mississippi River could negatively impact the richness of shorebirds and waterfowl occurring within the wetlands of the Mississippi Flyway as well as habitat for the Louisiana black bear. Sea level rise could inundate the coastal habitat of the American alligator and numerous species of frogs and toads. Ongoing reforestation programs such as restoration of bottomland hardwoods will remain of especial importance in the light of this forecast. Urban development and the effects of sea level rise threaten wildlife habitat and plant species in the Atlantic and Gulf Coastal Plain and Peninsular Florida. The projected inundation and loss of mangrove and coastal live oak forests would reduce nesting habitat for several birds, snakes, and reptiles. Forecasted development along the coastline portion of the Atlantic Flyway will likely eliminate important stopover habitat, as well as nesting areas for several imperiled sea turtles. Inland, the diversity of flora in fire-maintained Coastal Plain ecosystems is threatened by urban development and changing fire regimes. Urban development forecasted for the South will place continued demands on natural ecosystems, species, and their habitats. Biodiversity often declines as development proceeds: habitats for native species are replaced, while other habitats are modified or degraded. The forecasts also raise concern for conservation of imperiled species, bringing unique management challenges in areas becoming increasingly urbanized such as Peninsular Florida, the Blue Ridge, and the Piedmont. Losses of forests on the southern landscape would affect the persistence of species by changing the distribution and availability of spatial resources. Isolated populations in fragmented habitat are prone to inbreeding depression and genetic drift; this is especially true for those species that cannot disperse long distances. Strategic land acquisition may improve habitat quality by promoting connectivity and enabling movement of habitat-restricted species, especially in the face of climate change (Haddad and Baum 1999, Rosenburg and others 1998). There are a number of policies and programs that promote habitat conservation. These approaches include collaborative conservation plans, landowner incentive programs, and conservation easements. Climate change represents an additional source of stress on terrestrial species and ecosystems (Lovejoy and Hannah 2005). Climate scenarios are incorporated into the forest condition and land use futures analyses described previously. Chapter 3 also presents projections for temperature increase and variability in precipitation patterns over the next century; this may change the future distribution of many species. Species respond to environmental conditions based on habitat needs and physiological tolerances, which in turn influences community composition, structure, and resilience. A rise in temperature could influence seasonal movement, recruitment, and mortality (Inouye and others 2000). Changes in phenology (e.g., timing of resource availability, advances in flowering or nesting dates) may alter predator-prey, competitive interaction, and herbivore-vegetation dynamics. Characteristics of species at risk from climate change include those with restricted geographic range, fragmented distributions, and those that occur at the margins of their ranges. Other characteristics include limited dispersal ability, low genetic diversity, strong affinity to aquatic habitats, narrow physiological tolerance, and late maturation (Manley and Trani-Griep 2012, Midgley and others 2002). For example, the Southern Appalachian Mountains and Piedmont have an exceptionally high diversity of salamanders whose ecology is strongly influenced by temperature and precipitation; there is significant projected loss of high elevation habitat for these and other species existing at their thermal maxima (Milanovich and others 2010). Forest amphibians associated with cool, moist conditions may be subject to microclimates beyond their tolerance. Ephemeral streams and ponds may be especially vulnerable to drying with variable precipitation patterns; this may affect habitat limitations of several taxa. Matthews and others (2004) modeled the potential future distribution of eastern bird species under global climate change (table 14.11). Climate change has influenced the geographic range of species along environmental gradients; temperate birds have shifted their ranges to higher latitudes, affecting migration strategies and community composition (LaSorte and Jetz 2010). Successful migration will depend on the rate of climate change relative to essential habitat needs and key community interactions. Species may move into the habitats of others, creating new assemblages. The effect of this migration is unknown at this time. Climate warming (ranging between 0.14–0.49 °C and 2.0–2.6 °C) is projected across the South by 2050 (chapter 3). Warmer temperatures could decrease the winter cold period, which limits some species, but is tolerated by others, such as high-elevation plants (Larcher 2010) and is required for seed germination in others (Walck and Hidayati 2004). Although moderate change in average annual precipitation is projected, warmer temperatures could increase summer drought and fire potential, or allow less cold-tolerant plant species to establish. It is unlikely, however, that the large-scale shifts in forest communities predicted under longer-term climate warming scenarios (e.g., Dale and others 2010) will occur by 2060; fifty years is a short time for widespread dispersal and growth of long-lived species (such as trees). In addition, more immediate factors such as disturbance (e.g., trampling) and land use can override climate change effects on species distributions (Feeley and Silman 2010). Plant communities at high elevations may be particularly susceptible (Currie 2001, Malcolm and others 2006), where warming temperatures can lengthen the growing season. Forest communities in the Piedmont and Coastal Plain may be influenced by changes in fire frequency. Although some species of the fire-maintained longleaf pine – grassland ecosystem of the Coastal Plain Subregion might benefit from frequent fire, urban growth around major cities may override climate change effects on much of this ecosystem. Species whose ranges are limited to coastal areas will be vulnerable to projected changes in sea level as well as beach erosion. Sea level rise may inundate barrier islands, coastal wetlands, and marshes of the Coastal Plain, as well as along the eastern Atlantic and Gulf coasts. Communities that support threatened or endangered species are currently at-risk from a variety of environmental stressors. The small or disjunct populations that often accompany species of conservation concern are likely to be impacted by stochastic climatic events. Sensitive species, influenced by a number of stressors discussed in this chapter, may not have the ability to adapt to a changing climate. Thus, climate change projections pose important questions about future challenges for biological diversity in the South. aCanadian Climate Center Model and Hadley Center for Climate Prediction and Research Model. Decrease in abundance and range. Population losses in the South. Shift in range with losses in northern areas. Range expands northward; decrease in overall abundance. Substantial decrease in abundance and contraction in range. Extensive expansion northward and increase in abundance. Decrease in abundance and shift in range northward. Decrease in abundance in southern range. Reductions in numbers over its range in eastern forests. Increase in range from Tennessee northward. Decrease in abundance and range northward. 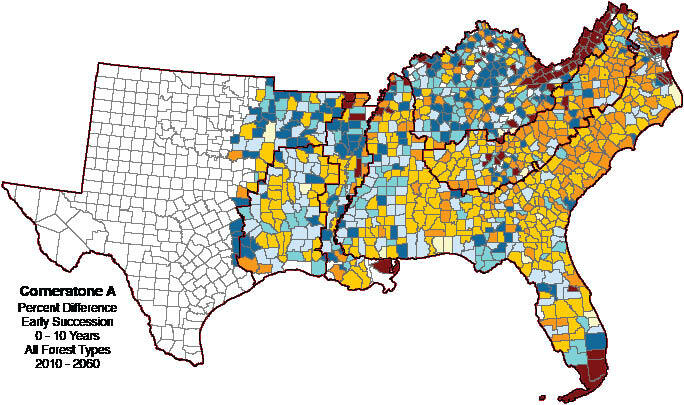 Loss in abundance in the south; population gains to the north. Shift in eastern population to northwest. Increase in abundance; expansion in range southward. High elevation forests, which occur above 4,000 feet, are too infrequent to be captured by Forest Inventory and Analysis data for this assessment. This provided the baseline for Forest Future modeling, precluding any accurate predictions of future changes. These forests traditionally have been subject to air pollution, acid deposition, and natural disturbances. Climate warming and housing development may result in the loss of endemic species or changes in species ranges. Upland hardwood forests are forecast to decline 14 percent over the region under the high urbanization and low timber demand predictions of Cornerstone B. The dominant forest type, oak-hickory, is forecasted to lose only 1 percent. However, distributions of oak-hickory forest species are predicted to shift northward, which could threaten forest interior species of this widespread and heavily used forest type. Although some areas of the Coastal Plain are forecasted to lose acreage of longleaf pine forest under the high urbanization and high timber demand predictions of Cornerstone A, other areas such as south-central Florida and northwest Alabama, are predicted to gain acreage of this forest type and are potential sites for expansion of the numerous vertebrates that inhabit this community. Maturation of southern forests raises concern about the loss of early successional habitat. Cornerstone A projects the greatest loss of young forest habitat in the Northern Ridge and Valley section of western Virginia, southern Florida and associated Keys, and scattered locations in the Northern Atlantic. Gains are forecasted for the Cumberland Plateau and Mountains and adjacent Southern Ridge and Valley, Apalachicola region of Florida, Ozark-Ouachita Highlands and adjacent northern area of the Mississippi Alluvial Valley. Finally, our analysis of biodiversity and the Southern Forest Futures projections underscores the challenges that resource managers face to conserve the rich species legacy of the South. The potential implications described herein bring uncertainty about how best to implement future conservation and management strategies. Although there is an existing framework of regulations and programs which promote species conservation (e. g., Endangered Species Act, sustainable forestry certification standards, among others), preparing for future growth will require new strategies to prepare for the changes in land use, forest conditions, and urbanization that are expected. For example, extinctions in longer lived species are expected to lag behind climate change; adaptation strategies across land ownerships will require anticipatory measures to ensure the future of the South’s biodiversity. New tools and approaches to managing uncertainty will become essential. Scenario planning, sensitivity analysis, or ecological risk analysis may become incorporated into resource planning for areas of concern. Integrating climate science into land management planning will be important, accompanied by monitoring strategies that identify patterns in disturbance, phenology, and species range changes. Furthermore, static management can no longer be assumed (Hayward and others 2009); that is, the environment will change in a directional way rather than varying around a mean condition (Milly and others 2008). The planning focus will be on spatial and temporal scales that are broader and longer than typically considered. As future impacts occur across large areas, the appropriate decision-making level may shift to cover landscape or regional scales. Enhancement of genetic diversity to provide resilience against environmental stressors. The geographic area managed by the Forest Service in the South makes it one of a few land stewards that can have a significant impact on the conservation and management of biodiversity. The agency will play a substantial role in the development and implementation of adaptation strategies. Nevertheless, there is a need for strong collaboration with State and Federal agencies, private landowners, and nongovernmental organizations to successfully implement management across landscapes at scales necessary to make substantive impacts on species and their habitats (Hayward and others 2009). A collaborative approach increases the scale of restoration and conservation on both public and private lands. Each species differs in its ability to tolerate climate change and other environmental stressors. An awareness of the relationship between the forecasts and the geographic pattern of species occurrence will foster planning efforts that arise from the Southern Forest Futures effort. The implications for the conservation of southern species are significant: in the midst of a growing region, the provision of biological diversity will become a critical conservation issue. The forecasts of biodiversity response were based on county-level patterns of coincidence for GIS maps of forecasted stressors, special forest communities, and species richness and rarity. This scale of analysis may over- or under-predict threats to species that occur at finer scales, such as rare species that occur at only a few locations within a county, or those that occur in scattered locations. Because this was a regional assessment, a selection was made early on by the Futures team as to a suitable, manageable scale. This turned out to be the county scale for the forecast and other analyses. Florida: Access restrictions in some areas have precluded thorough surveys on corporate timberlands across north Florida and on several large (over 10,000 acres) private ranches in central Florida. Kentucky: Limited access has precluded survey on the Ft. Campbell military installation (14,000 acres). North Carolina: Eighteen counties have not been systematically inventoried or are currently being inventoried: Alexander, Alleghany, Anson, Caldwell, Caswell, Cherokee, Clay, Dare, Graham, Macon, Mitchell, Robeson, Stanly, Swain, Tyrrell, Union, Wilkes, and Yancey. South Carolina: A comprehensive survey has not been done; the majority of gaps are on private lands. Tennessee: Data are limited for the Great Smoky Mountains National Park in east Tennessee due to data sensitivity; no data are available for Ft. Campbell in north-central Tennessee. Texas: Extensive areas of privately owned land have not been surveyed. Appreciation is extended to David Schmid and the Biological and Physical Resources Unit in the Southern Regional Office of the Forest Service for their ongoing support and encouragement. The editing efforts of Carol Whitlock and suggestions from four anonymous reviewers greatly improved the quality of this chapter. Our appreciation also is extended to Jason McNees at NatureServe for his tireless efforts supplying the biodiversity data and related spatial products. Shawna Reid, Southern Research Station, provided GIS support on the forecasts of special forest communities. Gary Wein, Highlands-Cashiers Landtrust, mapped initial draft maps of species richness and concern areas. Special thanks to Bobby Huggett, Dave Wear, and John Greis for their invaluable help while providing interpretation of forecast and Forest Inventory and Analysis data. Steve McNulty provided the sea level rise data described in the forecast section. Ed Laurent, American Bird Conservancy, contacted several Joint Venture and Bird Conservation Region coordinators for information on the current status and habitat concerns for priority birds in several subregions. Finally, our appreciation is offered to Ampaporn Mattox who assisted with the Internet searches, status rank updates, production of tables and figures, and species proofing; and to Haven Cook for selected table creation and miscellaneous checks. habitat fragmentation in plant populations: susceptible signals in plant traits and methodological approaches. Molecular Ecology. 17: 5177-5188. Bailey, M.A. ; Holmes, J.N. ; Buhlmann, K.A. ; Mitchell, J.C. 2006. Habitat management guidelines for amphibians and reptiles of the Southeastern United States. Partners in Amphibian and Reptile Conservation. Technical Publication HMG-2. Birmingham, AL: High Cotton Press. 88 p.
Baskin, J.M. ; Baskin, C.C. 2005. Ecology of two geographically restricted Astragalus species (Fabaceae), A. bibullatus and A. tennesseensis, of the Eastern United States. Brittonia. 57: 345-353. Boyce, S.G.; Martin, W.H. 1993. Introduction: the southeastern setting. In: Martin, W.H. ; Boyce, S.G.; Echternacht, A.C., eds. 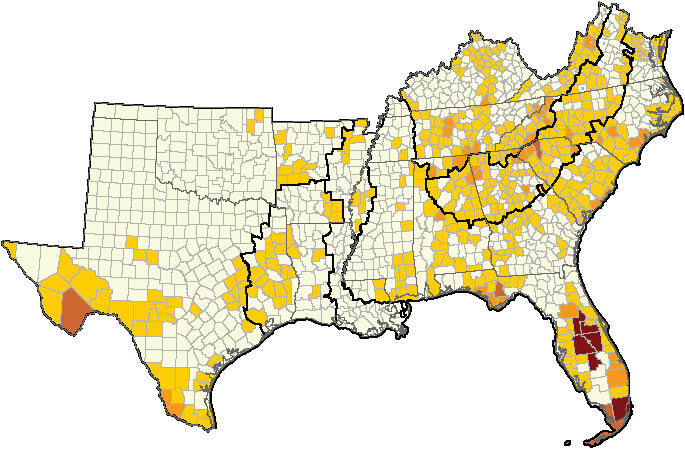 Biodiversity of the Southeastern United States: upland terrestrial communities. New York: John Wiley: 1-46. Buckner, E. 1989. Evolution of forest types in the Southeast. In: Waldrop, T.A., ed. Pine-hardwood mixture: a symposium on management and ecology of the type. Gen. Tech. Rep. SE-58. Asheville, NC: U.S. Forest Service, Southeastern Forest Experiment Station: 17-33. Case, M.A. ; Mlodozeniec, H.T. ; Wallace, L.E. ; Weldy, T.W. 1998. Conservation genetics and taxonomic status of the rare Kentucky lady’s slipper: Cypripedium kentuckiense (Orchidaceae). American Journal of Botany. 85: 1779-1786. Center for Plant Conservation. 2010a. National collection plant profile for Arabis perstellata. http://www.centerforplantconservation.org/collection/cpc_viewprofile.asp?CPCNum=6035. [Date Accessed: July 9, 2010]. Center for Plant Conservation. 2010b. National collection plant profile for Lesquerella globosa. http://www.centerforplantconservation.org/collection/cpc_viewprofile.asp?CPCNum=2499. [Date Accessed: July 9, 2010]. Chaplin, S.J. ; Gerrard, R.A.; Watson, H.M. [and others]. 2000. The geography of imperilment. In: Stein, B.A. ; Kutner, L.S. ; Adams, J.S., eds. Precious heritage: the status of biodiversity in the United States. New York: Oxford University Press: 159-200. Chapman, R. 2007. Northern long-eared myotis. In: Trani, M.K. ; Ford, W.M. ; Chapman, B.R., eds. 2007. The land manager’s guide to the mammals of the South. Chapel Hill, NC: The Nature Conservancy, Southeastern Region: 199–204. Crawford, B.A. ; Lucash, C.F. ; Henry, V.G. 2001. Red Wolf. In: Dickson, J., ed. Wildlife of the Southern forests: habitat and management. Blaine, WA: Hancock House Publishing: 240-247. Currie, D.J. 2001. Projected effects of climate change on patterns of vertebrate and tree species richness in the conterminous United States. Ecosystems. 4: 216-225. Dale, V.H. ; Tharp, M.L. ; Lannom, K.O. ; Hodges, D.G. 2010. Modeling transient response of forests to climate change. Science of the Total Environment. 408(8): 1888-1901. Delcourt, P.A. ; Delcourt, H.R. ; Morse, D.F. ; Morse, P.A. 1993. History, evolution, and organization of vegetation and human culture. In: Martin, W.H. ; Boyce, S.G.; Echternacht, A.C., eds. Biodiversity of the Southeastern United States: lowland terrestrial communities. New York: John Wiley: 47-79. Dobson, A.P. ; Rodriguez, J.P.; Roberts, W.M. ; Wilcove, D.S. 1997. Geographic distribution of endangered species in the United States. Science. 275: 550-553. Dodd, C.K., Jr. 1995. Reptiles and amphibians in the endangered longleaf pine ecosystem. In: LaRoe, E.T. ; Farris, G.S. ; Puckett, C.E. [and others], eds. Our living resources: a report to the nation on the distribution, abundance, and health of U.S. plants, animals, and ecosystems. Washington, DC: U.S. Department of the Interior, National Biological Service: 129-131. Ernst, C.H. ; Barbour, R.W. ; Lovich, J.E. 1994. Turtles of the United States and Canada. Washington, DC: Smithsonian Institution Press. 578 p.
Erwin, R.M. ; Cahoon, D.R. ; Prosser, D.J. [and others]. 2006. Surface elevation dynamics in vegetated Spartina marshes versus unvegetated tidal ponds along the mid-Atlantic coast, USA, with implications to waterbirds. Estuaries and Coasts. 29(1): 96-106. Feeley, K.J. ; Silman, M.R. 2010. Land-use and climate change effects on population size and extinction risk of Andean plants. Global Change Biology. 16(12): 3215-3222. Flather, C.H. ; Knowles, M.S. ; McNees, J. 2008. Geographic patterns of at-risk species: a technical document supporting the U.S. Department of Agriculture Forest Service Interim Update of the 2000 RPA Assessment. Gen. Tech. Rep. RMRS-GTR-211. Fort Collins, CO: U.S. Department of Agriculture Forest Service, Rocky Mountain Research Station. 21 p.
Ford, W.M. ; Chapman, B.R. 2007. Indiana myotis. In: Trani, M.K. ; Ford, W.M. ; Chapman, B.R., eds. 2007. The land manager’s guide to the mammal’s of the South. Chapel Hill, NC: The Nature Conservancy, Southeastern Region: 205–211. Fridley, J.D. ; Senft, A.R. ; Peet, R.K. 2009. Vegetation structure of field margins and adjacent forests in agricultural landscapes of the North Carolina Piedmont. Castanea. 74(4): 327-339. Gibbons, J.W. ; Buhlmann, K.A. 2001. Reptiles and amphibians. In: Dickson, J., ed. Wildlife of the southern forests: habitat and management. Blaine, WA: Hancock House Publishing: 372-390. Godt, M.J.W. ; Hamrick, J.L. 1995. Allozyme variation in two Great Smoky Mountain endemics: Glyceria nubigena and Rugella nudicaulis. Journal of Heredity. 86: 194-198. Godt, M.J.W. ; Johnson, B.R. ; Hamrick, J.L. 1996. Genetic diversity and population size in four rare southern Appalachian plant species. Conservation Biology. 10(3): 796-805. Guirado, M.; Pino, J.; Rodà, F. 2006. Understory plant species richness and composition in metropolitan forest archipelagos: effects of forest size, adjacent land use and distance to the edge. Global Ecology and Biogeography. 15(1): 50-62. Haddad, N.M.; Baum, K.A. 1999. An experimental test of corridor effects on butterfly densities. Ecological Application. 9: 623-633. Harvey, M.J.; Saugey, D.A. 2001. Bats. In: Dickson, J., ed. Wildlife of the southern forests: habitat and management. Blaine, WA: Hancock House Publishing: 359-371 p.
Hayward, G.D.; Flather, C.H. ; Uloth, E. [and others]. 2009. Managing fish and wildlife habitat in the face of climate change: U.S. Department of Agriculture Forest Service perspective. North American Wildlife and Natural Resources Conference. 74: 98-109. Healy, R.G. 1985. Competition for land in the American south: agriculture, human settlement, and the environment. Washington, DC: The Conservation Foundation. 333 p.
Herrig, J.; Shute, P. 2002. Aquatic animals and their habitats. In: Wear, D.N. ; Greis, J.G., eds. Southern forest resource assessment. Gen. Tech. Rep. SRS-53. Asheville, NC: U.S.Forest Service, Southern Research Station: 537-582. Honu, Y.A.K. ; Chandy, S.; Gibson, D.J. 2009. Occurrence of non-native species deep in natural areas of the Shawnee National Forest, Southern Illinois, USA. Natural Areas Journal. 29(2): 177-187. Ibanez, I.; Clark, J.S. ; LaDeau, S.; HilleRisLambers, J. 2007. Exploiting temporal variability to understand tree recruitment response to climate change. Ecological Monographs. 77: 163-177. Inouye, D.W.; Barr, B.; Armitage, K.B. ; Inouye, B.D. 2000. Climate change is affecting altitudinal migrants and hibernating species. Proceedings of the National Academy of Sciences. 97(4): 1630-1633.
International Union for Conservation of Nature. 2009. International Union for Conservation of Nature Red list of threatened species. Version 2009.1. http://www.iucnredlist.org. [Date accessed: July 9, 2010]. Iverson, L.R. ; Prasad, A.M.; Matthews, S.N. ; Peters, M. 2008. Estimating potential habitat for 134 eastern U.S. tree species under six climate scenarios. Forest Ecology and Management. 254: 390-406. Kral, R.D. 1983. Asteraceae: Eupatorium luciae-brauniae Fernald [Endangered species, perennial plants of shaded sandstone ledges in Kentucky and Tennessee]. In: Kral, R.D., ed. A report on some rare, threatened, or endangered forest-related vascular plants of the South. Technical publication R8-TP. Atlanta, GA: U.S. Department of Agriculture Forest Service, Southern Region: 1143-1146. Larcher, W.; Kainmuller, C.; Wagner, J. 2010. Survival types of high mountain plants under extreme temperatures. Flora. 205(1): 3-18. LaSorte, F.; Jetz, W. 2010. Avian distributions under climate change: towards improved projections. Journal of Experimental Biology. 213: 862-869. LeBlond, R.J. 2001. Endemic plants of the Cape Fear Arch Region. Castanea. 66: 83-97. Lorimer, C.G. 2001. Historical and ecological roles of disturbance in eastern North American forests: 9,000 years of change. Wildlife Society Bulletin. 29(2): 425-439. Lovejoy, T.E. ; Hannah, L.J., eds. 2005. Climate change and biodiversity. New Haven, CO: Yale University Press. 440 p.
Lower Mississippi Valley Joint Venture Forest Resource Conservation Working Group. 2007. Restoration, management, and monitoring of forest resources in the Mississippi Alluvial valley: recommendations for enhancing wildlife habitat. Vicksburg, MS: LSU Printing Services. 88 p.
MacArthur, R.; Wilson, E. 1967. The theory of island biogeography. Princeton, NJ: Princeton University Press. 203 p.
Malcolm, J.R.; Liu, C.; Neilson, R.P. [and others]. 2006. Global warming and extinctions of endemic species from biodiversity hotspots. Conservation Biology. 20(2): 538-548. Manley, P.N. ; Trani-Griep, M.K. 2012. Biodiversity and climate change. U.S. Department of Agriculture Forest Service, Climate Change Resource Center. http://www.fs.fed.us/ccrc/topics/biodiversity.shtml. [Date Accessed: July 9, 2010]. Matlack, G.R. 1994. Vegetation dynamics of the forest edge: trends in space and successional time. Journal of Ecology. 82: 113-123. Matthews, S.; O’Connor, R.; Iverson, L.; Prasad, A. 2004. Atlas of climate change effects in 150 bird species of the Eastern United States. Gen. Tech. Rep. NE-318. Newtown Square, PA: U.S. Department of Agriculture Forest Service, Northeastern Research Station. 340 p.
McCay, T.S. 2007. Cotton mouse (Peromyscus gossypinus). In: Trani, M.K. ; Ford, W.M. ; Chapman, B.R., eds. 2007. The land manager’s guide to the mammal’s of the South. Chapel Hill, NC: The Nature Conservancy, Southeastern Region: 327-331. McNees, J. 2010. 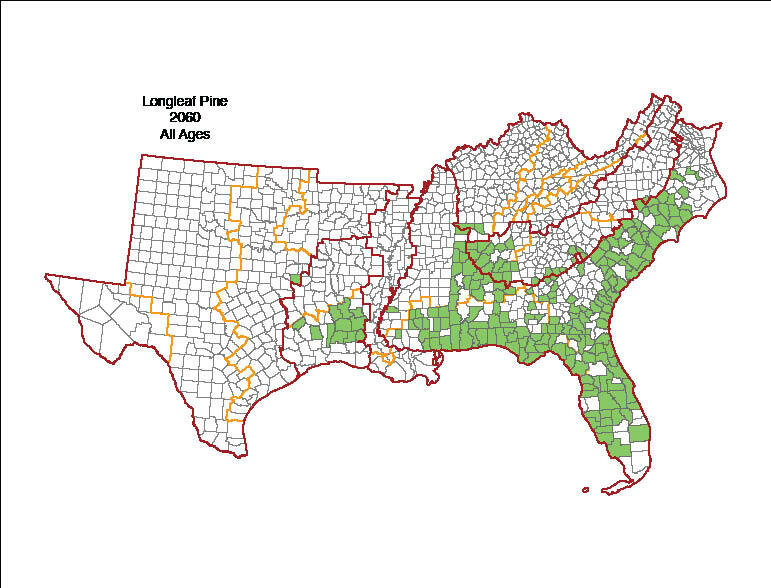 Metadata for the U.S. Forest Service: Southern Forest Futures assessment species dataset. NatureServe central databases (July 21, 2010). Arlington, VA: NatureServe. 56 p. http://www.srs.fs.usda.gov/futures/data/. [Date accessed: July 31, 2010]. Midgley, G.F.; Hannah, L.; Millar, D. [and others]. 2002. Assessing the vulnerability of species richness to anthropogenic climate change in a biodiversity hotspot. Global Ecology and Biogeography. 11: 445-451. Milanovich, J.R.; Peterman, W.E. ; Nibbelink, N.P. ; Maerz, J.C. 2010. Projected loss of a salamander diversity hotspot as a consequence of projected global climate change. PLoS One. 5(8): 1-10. Milly, P.C.D. ; Betancourt, J.; Falkenmark, M. [and others]. 2008. Stationarity is dead: whither water management? Science. 319: 573-574. Mitchell, R.J.; Hiers, J.K.; O’Brien, J.J. [and others]. 2006. Silviculture that sustains: the nexus between silviculture, frequent prescribed fire, and conservation of biodiversity in longleaf pine forests of the Southeastern United States. Canadian Journal of Forest Research. 36: 2724-2736. Moore, P.T. ; Van Miegroet, H.; Nicholas, N.S. 2008. Examination of forest recovery scenarios in a Southern Appalachian Picea-Abies forest. Forestry. 81: 183-194. Murdock, N. 1993. Recovery plan for Spreading Avens (Geum radiatum) Rafinesque. Southeast Region. Atlanta, GA: U.S. Fish and Wildlife Service. 32 p.
Murdock, N.A. 1994. Rare and endangered plants and animals of Southern Appalachian wetlands. Water Air and Soil Pollution. 77: 385-405. NatureServe. 2007. Digital distribution maps of the reptiles of the United States and Canada. [Shapefiles]. Arlington, VA: NatureServe. http://www.natureserve.org/getData/animalData.jsp. [Date accessed: January 28, 2010]. NatureServe. 2010. An online encyclopedia of life. [Database]. 2010. Version 7.1. Association for biodiversity information. Arlington, VA: NatureServe. http://www.natureserve.org/getData/animalData.jsp. [Date accessed: January–June 30, 2010]. NatureServe. 2011. An online encyclopedia of life. [Database]. 2010. Version 7.1. Association for biodiversity information. Arlington, VA: NatureServe. http://www.natureserve.org/getData/animalData.jsp. [Date accessed: February 15-April 4, 2011]. Noss, R.F. ; LaRoe, E.T., III; Scott, J.M. 1995. Endangered ecosystems of the United States: a preliminary assessment of loss and degradation. Biological Report 28. Washington, DC: National Biological Service. 58 p.
Patterson, B.D. ; Ceballos, G.; Sechrest, W. [and others]. 2007. Digital distribution maps of the mammals of the western hemisphere. Version 3.0. [Shapefiles]. Arlington, VA: NatureServe.http://www.natureserve.org/getData/animalData.jsp. [Date accessed: January 28, 2010]. Pelton, M.R. 2001. American black bear. In: Dickson J., ed. Wildlife of the Southern forests: habitat and management. Blaine, WA: Hancock House Publishing: 224-233. Possley, J.; Woodmansee, S.W. ; Maschinski, J. 2008. Patterns of plant composition in fragments of globally imperiled pine rockland forest: effects of soil type, recent fire frequency, and fragment size. Natural Areas Journal. 28(4): 379-394. Prasad, A.; Iverson, L.; Matthews, S.; Peters, M. 2009. Atlases of tree and bird species habitats for current and future climates. Ecological Restoration. 27: 260-263. Ridgely, R.S. ; Allnutt, T.F. ; Brooks, T. [and others]. 2007. Digital distribution maps of the birds of the western hemisphere. Version 3.0. [Shapefiles]. Arlington, VA: NatureServe. http://www.natureserve.org/getData/animalData.jsp. [Date accessed: January 28, 2010]. Rosenburg, D.K. ; Noon, B.R. ; Megahan, J.W. ; Meslow, E.C. 1998. Compensatory behavior of Ensatina eschscholtzii in biological corridors: a field experiment. Canadian Journal of Zoology. 76: 117-133. Rudolph, D.C.; Burgdorf, S.J. 1997. Timber rattlesnakes and Louisiana pine snakes of the west Gulf Coastal Plain: hypothesis of decline. Texas Journal of Science. 49: 111-121. Rutledge, D.T. ; Lepczyk, C.A. ; Xie, J.; Liu, J. 2001. Spatiotemporal dynamics of endangered species hotspots in the United States. Conservation Biology. 15: 475-487. Schwartz, M.W. ; Hermann, S.M. ; van Mantgem, P.J. 2000. Estimating the magnitude of decline of the Florida torreya (Torreya taxifolia Arn.). Biological Conservation. 95: 77-84. Semlitsch, R.D. ; Bodie, J.R. 1998. Are small, isolated wetlands expendable? Conservation Biology. 12: 1129-1133. Snyder, K.M. ; Baskin, J.M. ; Baskin, C.C. 1994. Comparative ecology of the narrow endemic Echinacea tennesseensis and 2 geographically widespread congeners: relative competitive ability and growth characteristics. International Journal of Plant Science. 15: 57-65. Sorrie, B.A. ; Gray, J.B.; Crutchfield, P.J. 2006. The vascular flora of the longleaf pine ecosystem of Fort Bragg and Weymouth Woods, North Carolina. Castanea. 71: 129-161. Stein, B.A. ; Kutner, L.S. ; Adams, J.S., eds. 2000. Precious heritage: the status of biodiversity in the United States. The Nature Conservancy. New York: Oxford University Press. 399 p.
Thompson, F.R., III; DeGraaf, R.M. 2001. Conservation approaches for woody-early successional communities in the Eastern United States. Wildlife Society Bulletin. 29: 483-494. Timmerman-Erskine, M.; Ballenger, J.; Dute, R.R. ; Boyd, R.S. 2003. Allozyme investigation of the Trillium pusillum Michaux complex (Trilliaceae): taxonomic and conservation implications. Journal of the Torrey Botanical Society. 130: 1-10. Trani, M.K. 2002a. Maintaining species in the South. In: Wear, D.N. ; Greis, J.G., eds. Southern forest resource assessment. Gen. Tech. Rep. SRS-53. Asheville, NC: U.S. Forest Service, Southern Research Station: 113-152. Trani, M.K. 2002b. Terrestrial ecosystems. In: Wear, D.N. ; Greis, J.G., eds. Southern forest resource assessment. Gen. Tech. Rep. SRS-53, Asheville, NC: U.S. Forest Service, Southern Research Station: 3-46. Trani, M.K. ; Brooks, R.T.; Schmidt, T.L. [and others]. 2001. Patterns and trends of early successional forests in the Eastern United States. Wildlife Society Bulletin. 29(2): 413-424. Trani, M.K. ; Chapman, B.R. 2007. Red Wolf. In: Trani, M.K. ; Ford, W.M. ; Chapman, B.R., eds. 2007. The land manager’s guide to the mammals of the South. Chapel Hill, NC: The Nature Conservancy, Southeastern Region: 441-445. Trani, M.K. ; Ford, W.M. ; Chapman, B.R., eds. 2007. The land manager’s guide to the mammal’s of the South. Chapel Hill, NC: The Nature Conservancy, Southeastern Region. 546 p .
Trusty, J.L. ; Miller, I.; Boyd, R.S. [and others]. 2009. Ex situ conservation of the federally endangered plant species Clematis socialis Kral (Ranunculaceae). Natural Areas Journal. 29: 376-384. Turner, M.G. ; Pearson, S.M. ; Bolstad, P.; Wear, D.N. 2003. Effects of land-cover change on spatial pattern of forest communities in the Southern Appalachian Mountains (USA). Landscape Ecology. 18: 449-464. U.S. Department of Interior, Fish and Wildlife Service. 2011. Southeast Region 4. [Database]. http://www.fws.gov/endangered/regions/index.html#tabs-4. [Date accessed: April 2011]. U.S. Department of Agriculture National Resources Conservation Service Plants Database. 2010. [Database]. http://plants.usda.gov. [Date accessed: July 13, 2010]. Van Lear, D.H.; Carroll, W.D. ; Kapeluck, P.R. ; Johnson, R. 2005. History and restoration of the longleaf pine-grassland ecosystem: implications for species at risk. Forest Ecology and Management. 211: 150-165. Virnstein, R.W. ; Hall, L.M. 2009. Northern range extension of the seagrasses, Halophila johnsonii and Halophila decipienis, along the east coast of Florida, USA. Aquatic Botany. 90: 89-92. Walck, J.L. ; Hidayati, S.N. 2004. Germination ecophysiology of the western North American species Osmorhiza depauperata (Apiaceae): implications of preadaptation and phylogenetic niche conservatism in seed dormancy evolution. Seed Science Research. 14(4): 387-394. Wear, D.N. ; Bolstad, P. 1998. Land-use changes in Southern Appalachian landscapes: spatial analysis and forecast evaluation. Ecosystems. 1: 575-594. Wear, D.N. ; Greis, J.G. ; Walters, N. 2009. The Southern Forest Futures Project: using public input to define the issues. Gen. Tech. Rep. SRS-115. Asheville, NC: U.S. Department of Agriculture Forest Service, Southern Research Station. 17 p.
Weigl, P.D. 2007. The northern flying squirrel (Glaucomys sabrinus): a conservation challenge. Journal of Mammalogy. 88(4): 897-907. White, P.S. ; Collins, B.; Wein, G.R. 2011. Natural disturbances and early successional habitat. In: Greenberg, C.; Collins, B.; Thompson, F., eds. Sustaining young forest communities: ecology and management of early successional habitat in the U.S. central hardwood region. New York: Springer-Verlag: 27-40. White, P.S. ; Wilds, S.P. ; Thunhorst, G.A. 1998. Southeast. In: Mac, M.J.; Opler, P.A. ; Puckett Haecker, C.E. ; Doran, P.D., eds. Status and trends of the nation’s biological resources. Reston, VA: U.S. Department of the Interior, U.S. Geological Survey: 255-314. Wilcove, D.S. ; Rothstein, D.; Dubow, J. [and others]. 1998. Quantifying threats to imperiled species in the United States. BioScience. 48(8): 607-615. Williams, M. 1989. Americans and their forests: a historical geography. New York: Cambridge University Press. 599 p.
Wilson, L.A. 1995. The land manager’s guide to the amphibians and reptiles of the South. Chapel Hill, NC: The Nature Conservancy, Southeastern Region. 360 p.
Woudenberg, S.W. ; Conkling, B.L. ; O’Connell, B.M. [and others]. 2010. The forest inventory and analysis database: database description and user manual. Version 4.0 for phase 2. Gen. Tech. Rep. RMRS-GTR-245. Ogden, UT and Fort Collins, CO: U.S. Department of Agriculture Forest Service, Rocky Mountain Research Station. 336 p.
Margaret Trani Griep is the Regional Wildlife Ecologist, Southern Region, U.S. Department of Agriculture Forest Service, Atlanta, GA 30309. Beverly Collins is an Associate Professor, Department of Biology, Western Carolina University, Cullowhee, NC 28734.